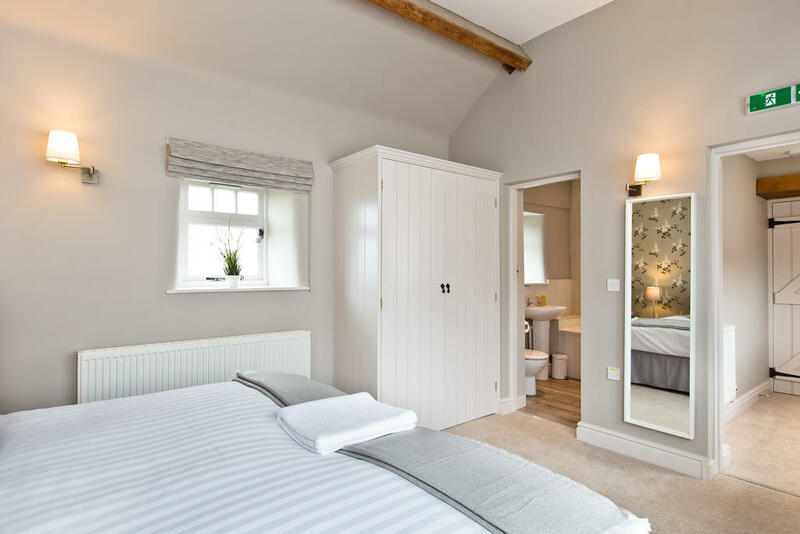 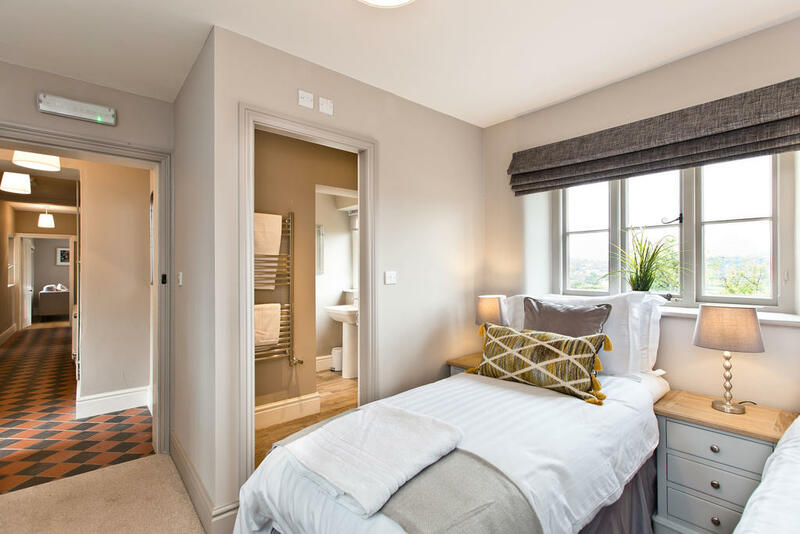 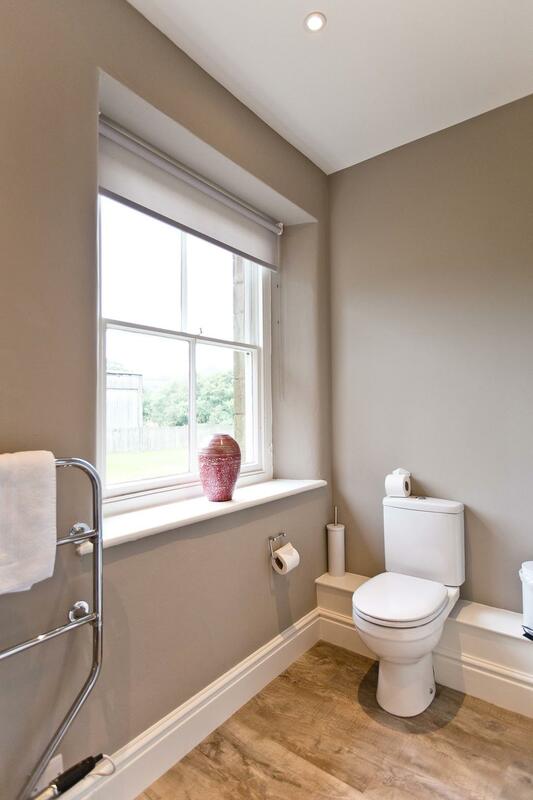 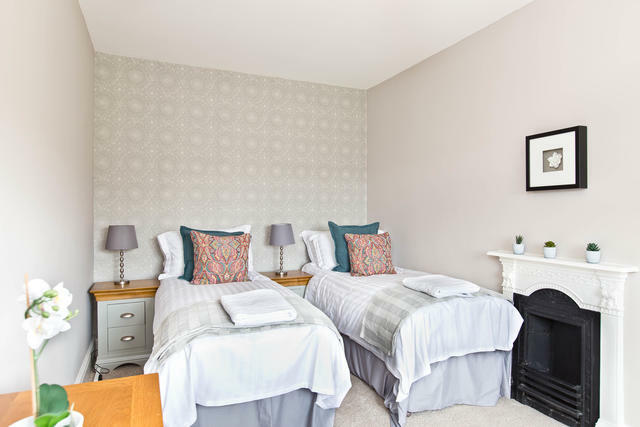 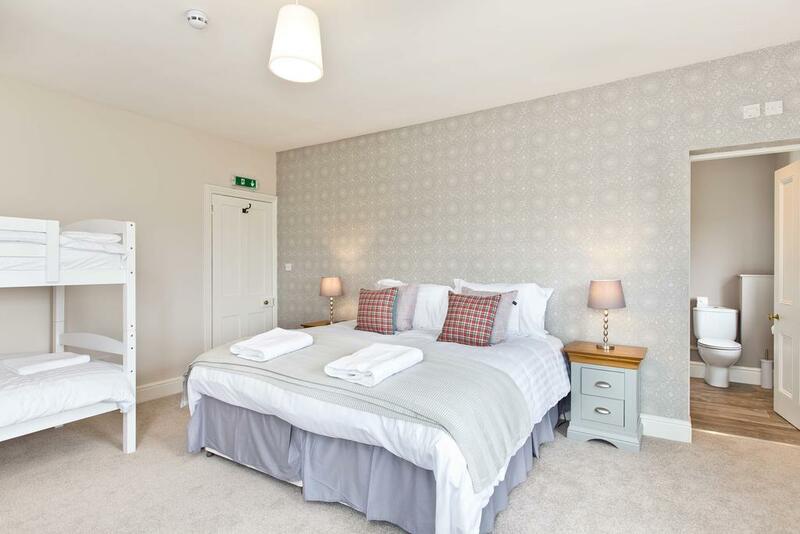 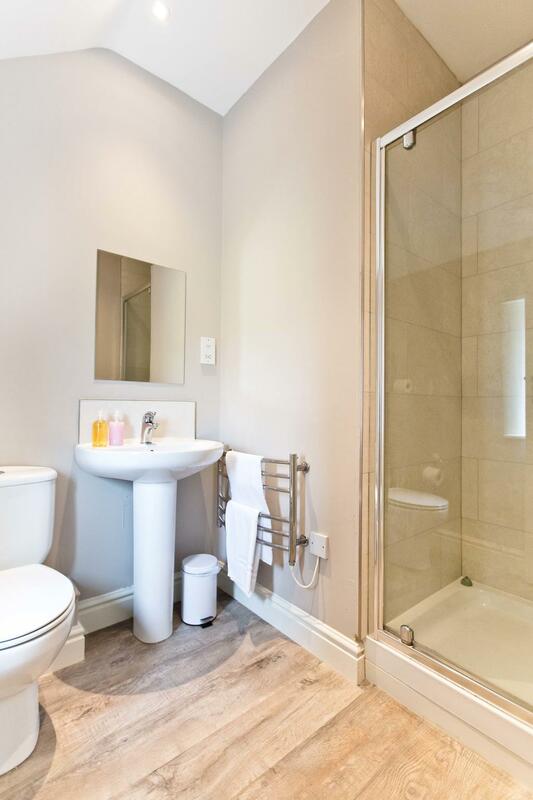 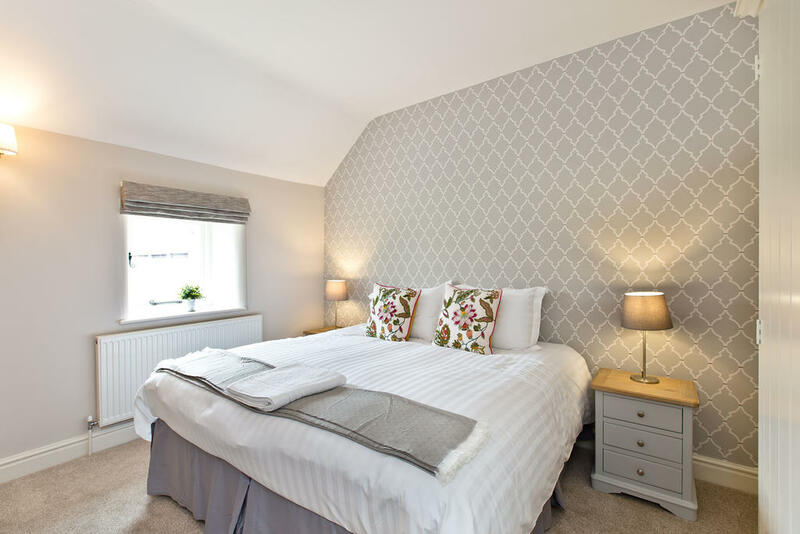 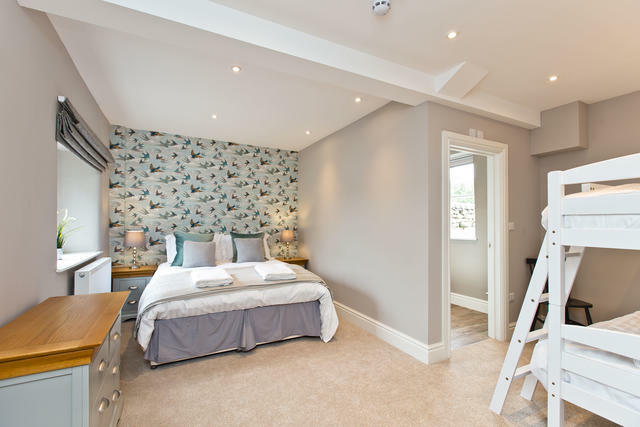 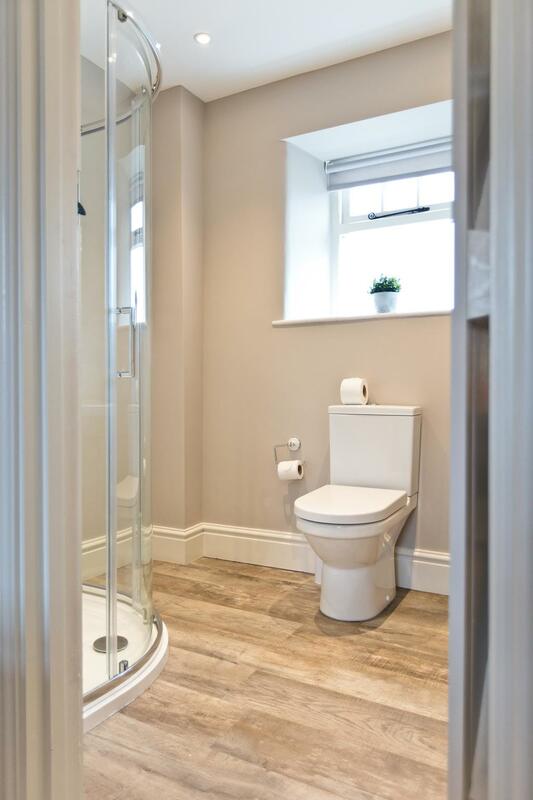 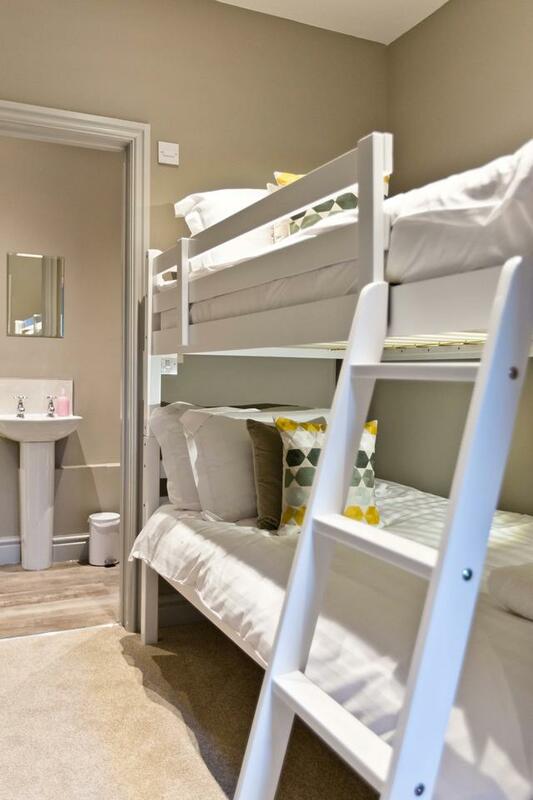 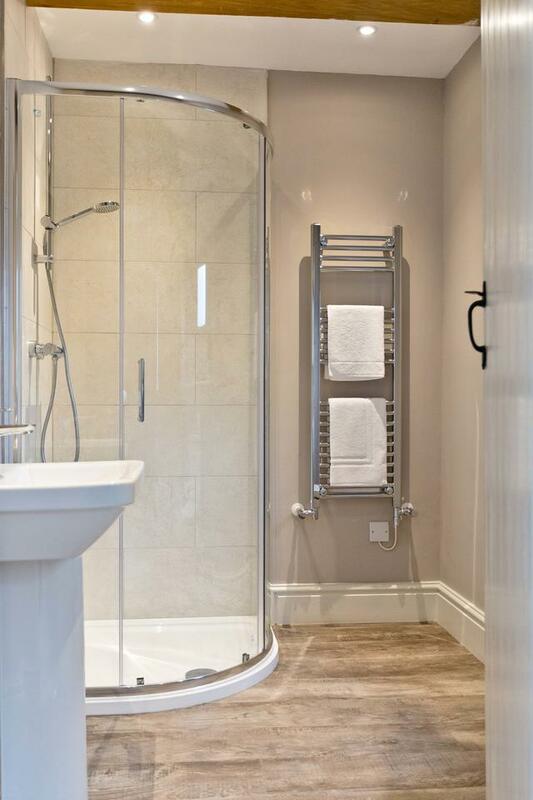 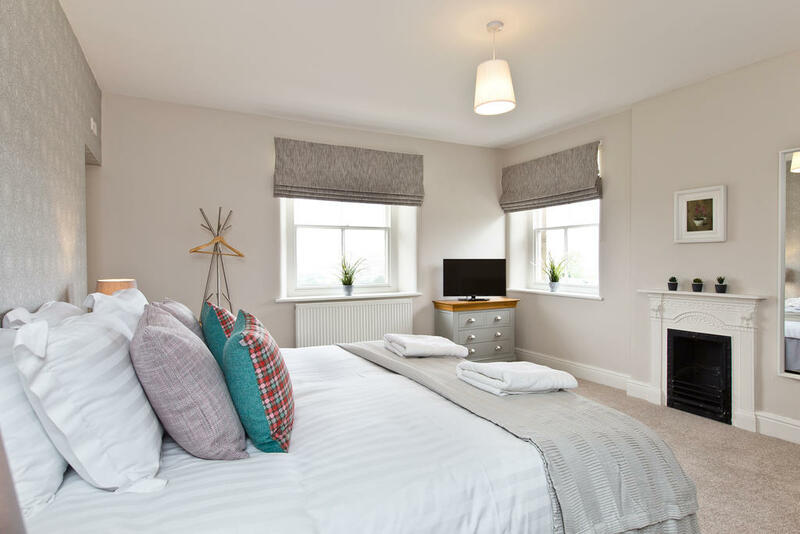 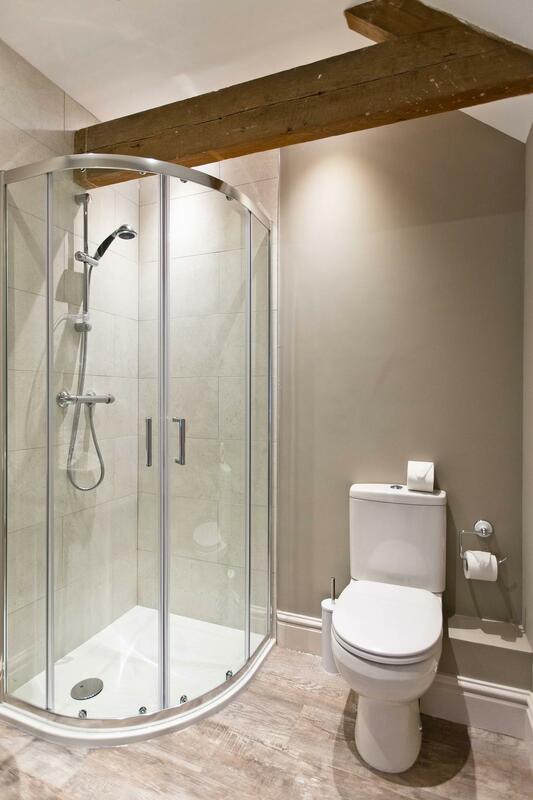 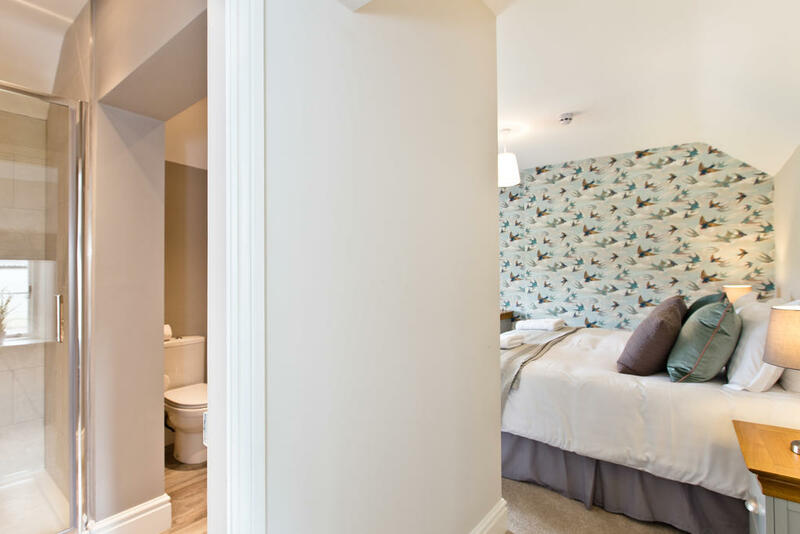 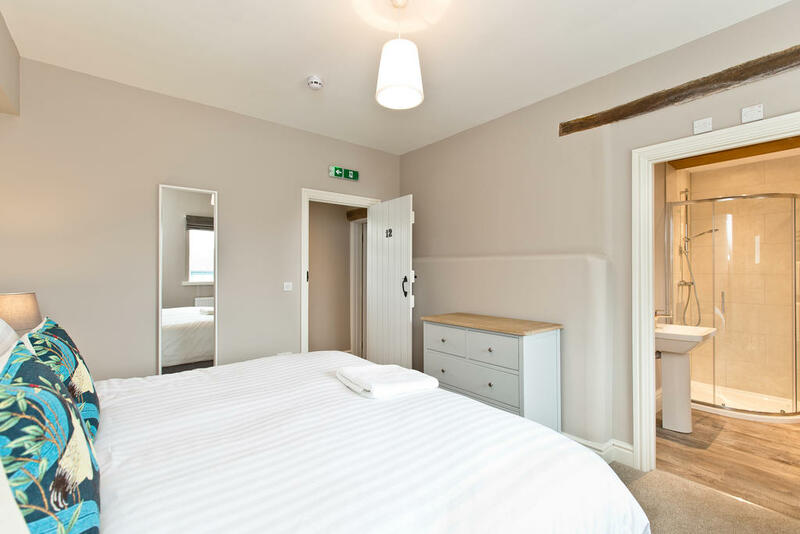 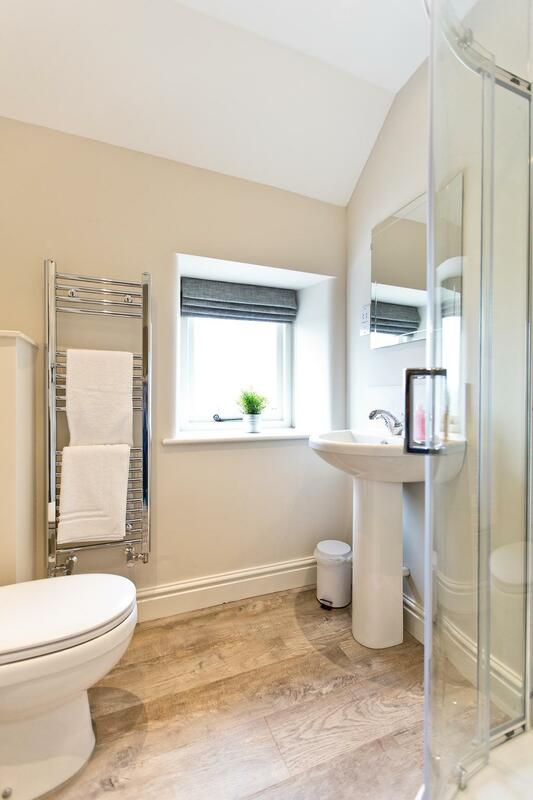 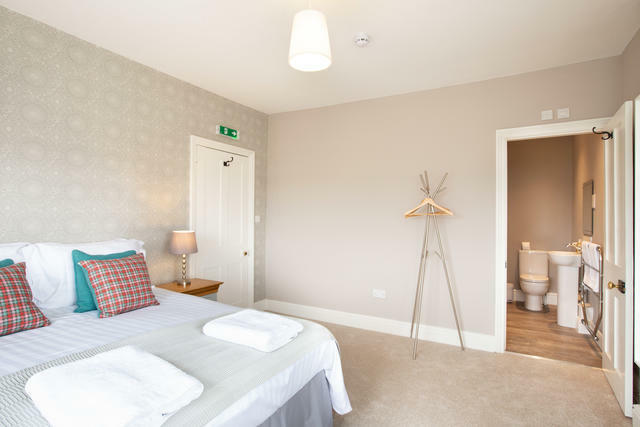 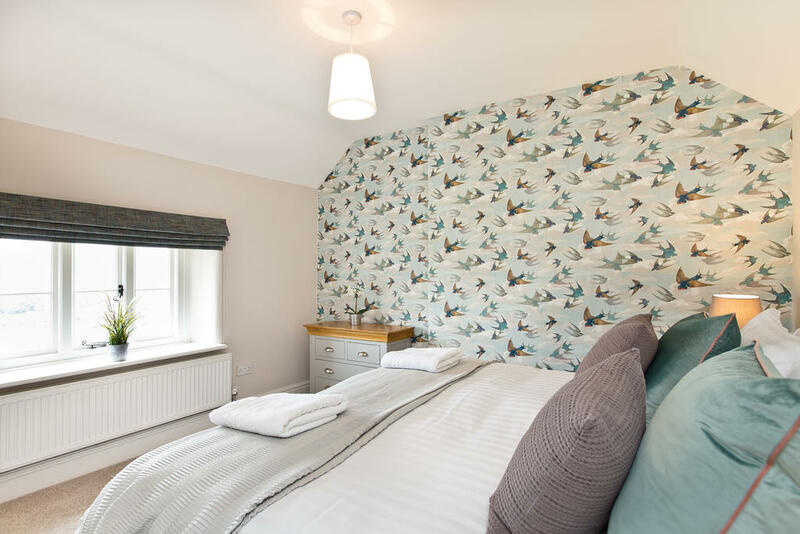 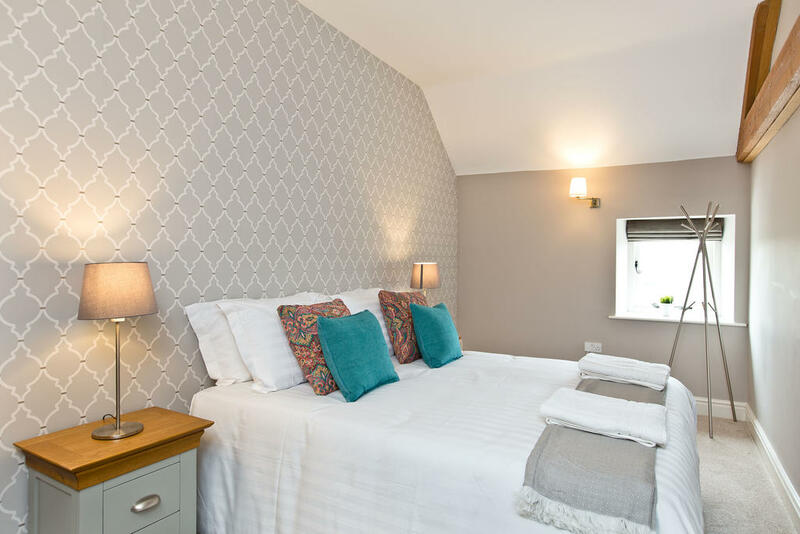 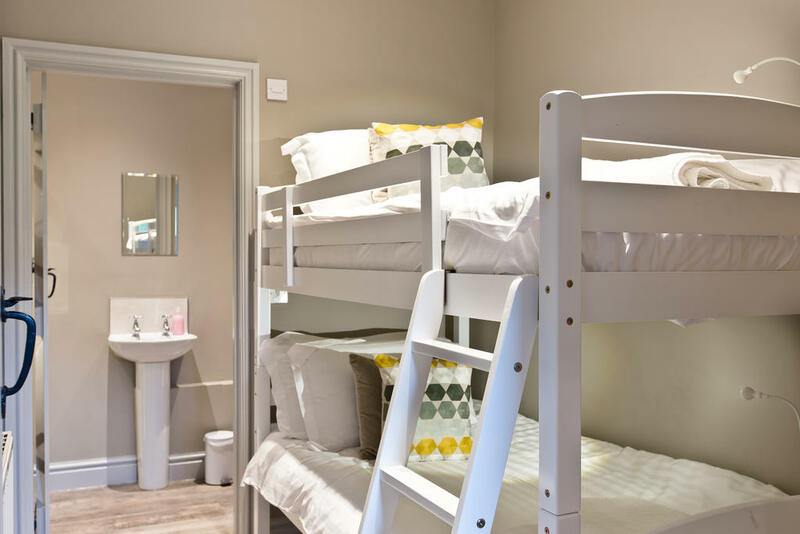 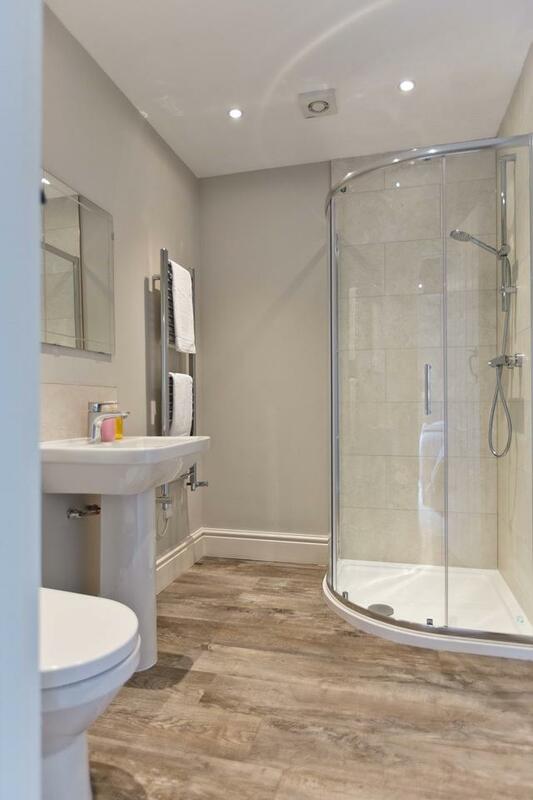 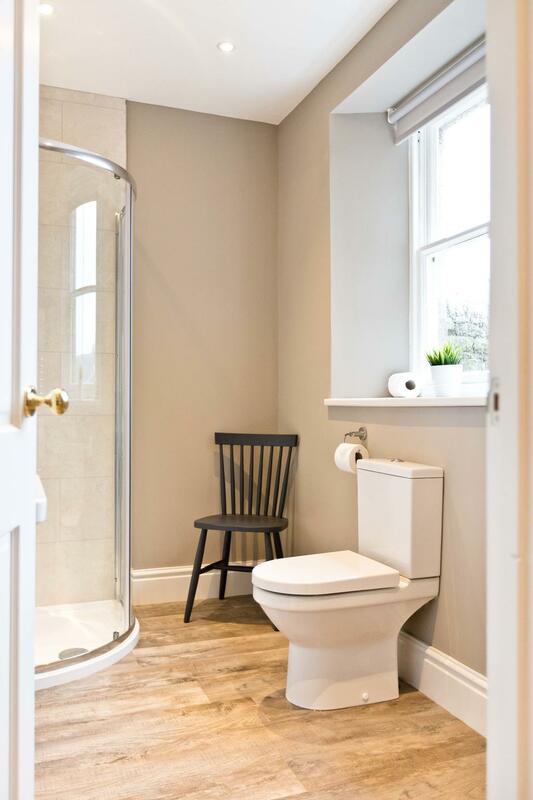 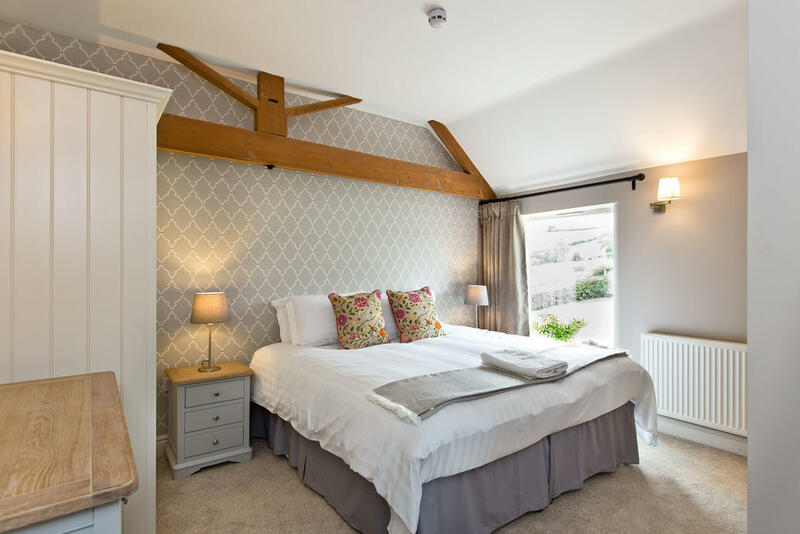 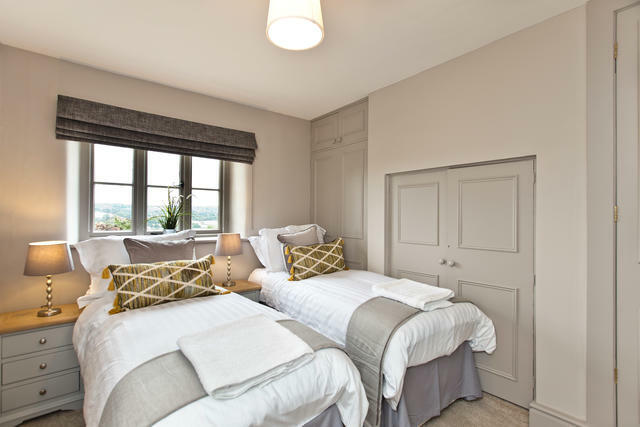 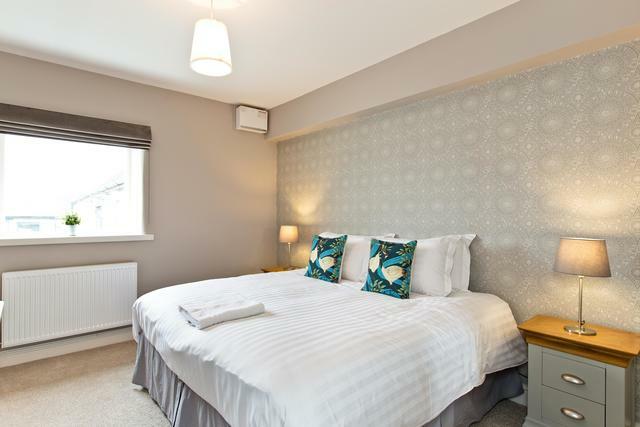 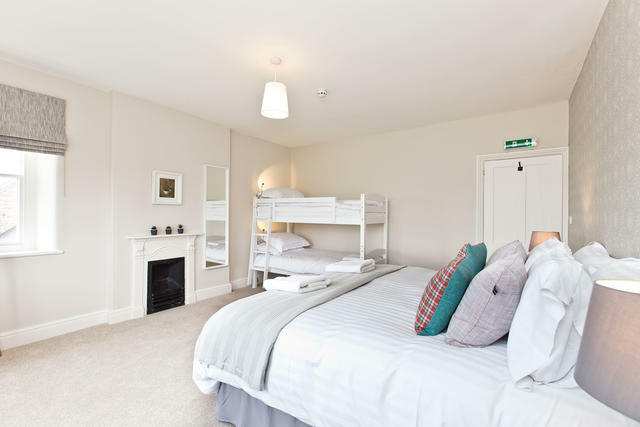 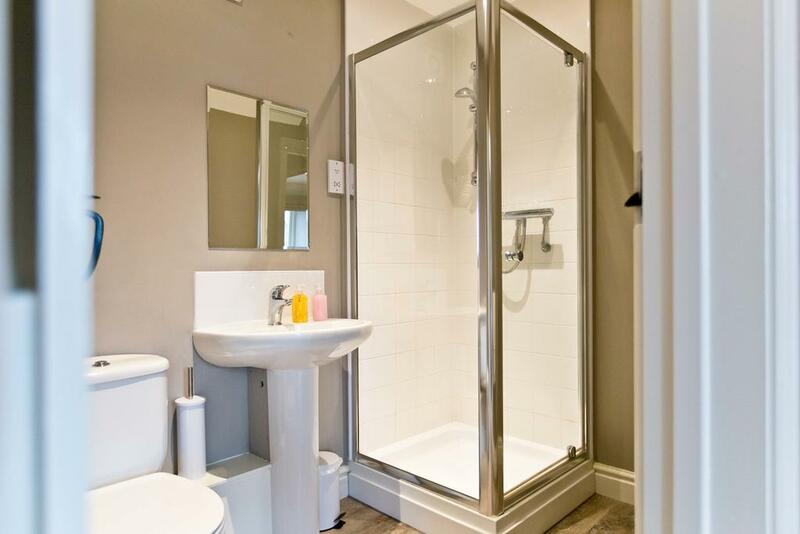 There are a total of twenty one boutique styled bedrooms most with private bathroom facilities which have been individually decorated and carefully styled. 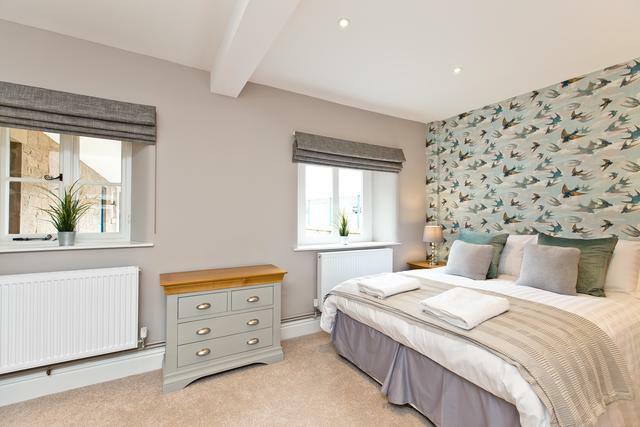 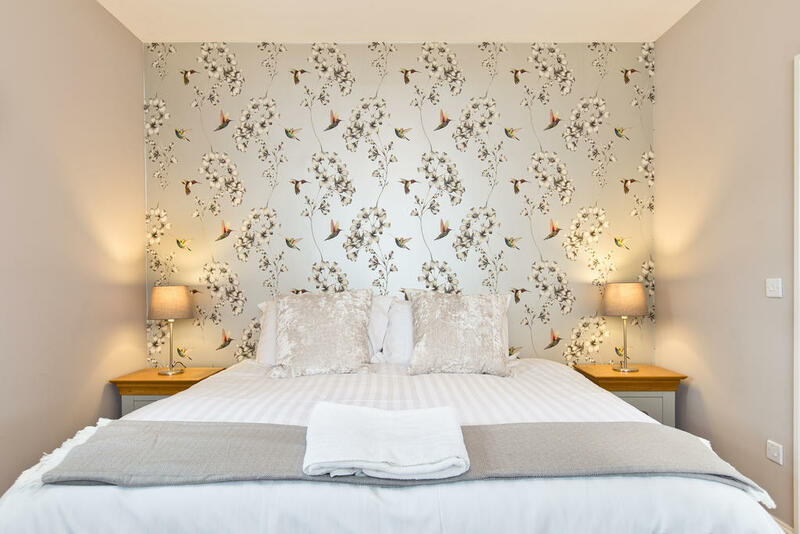 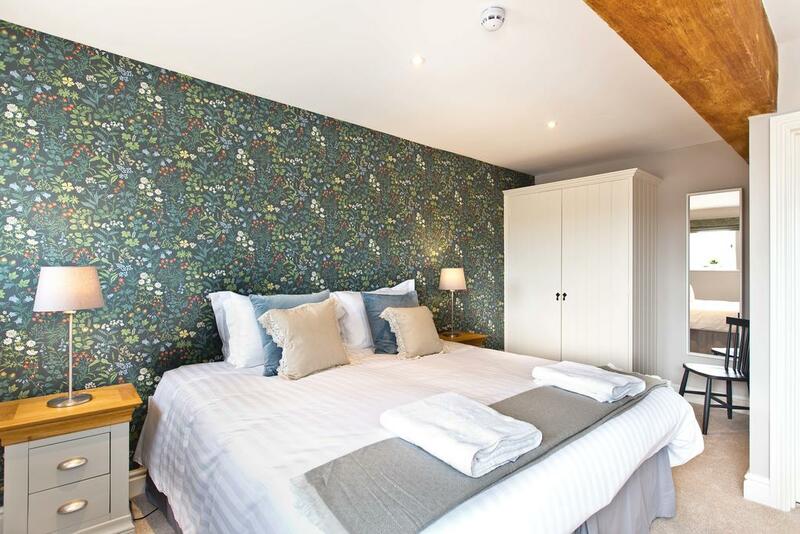 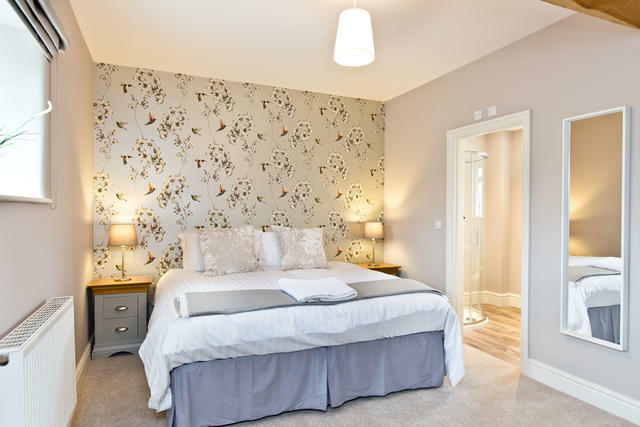 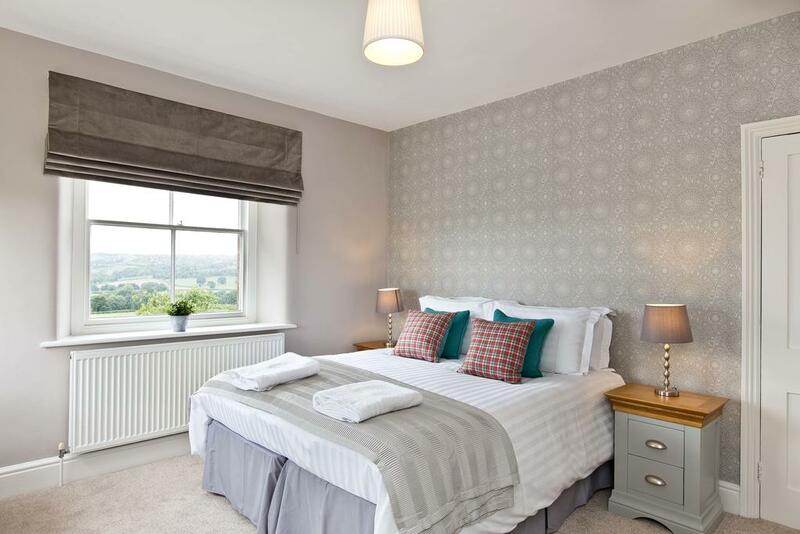 Each bedroom boasts stunning wallpapers, plump cushions and luxurious bedding. 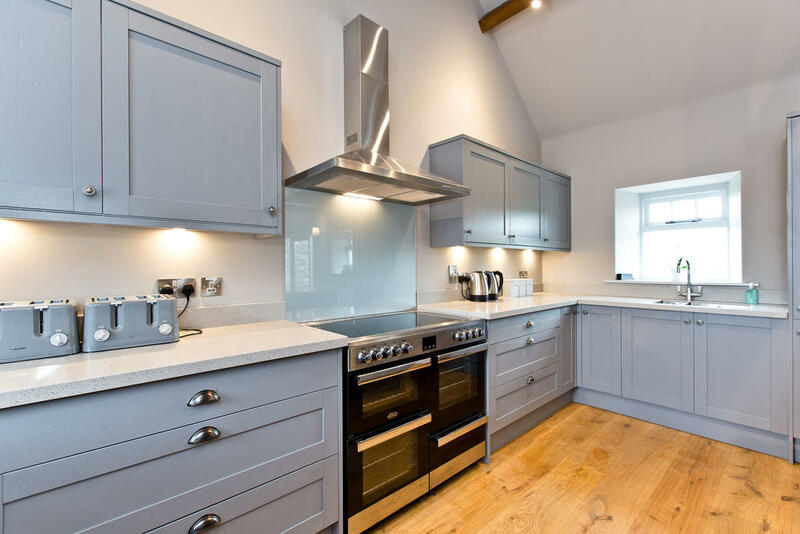 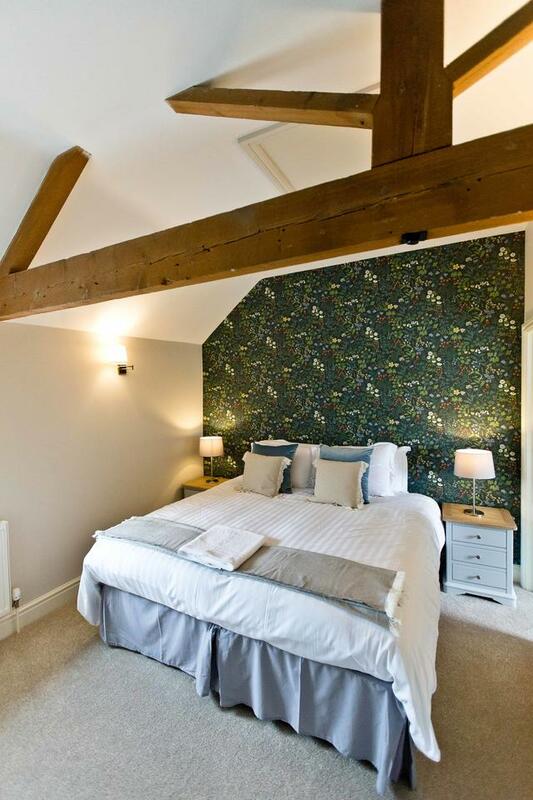 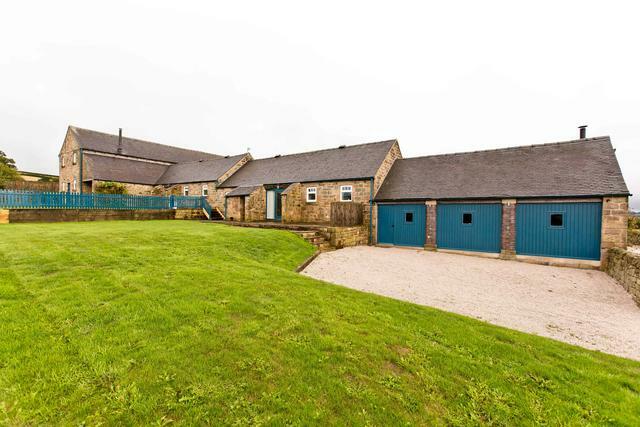 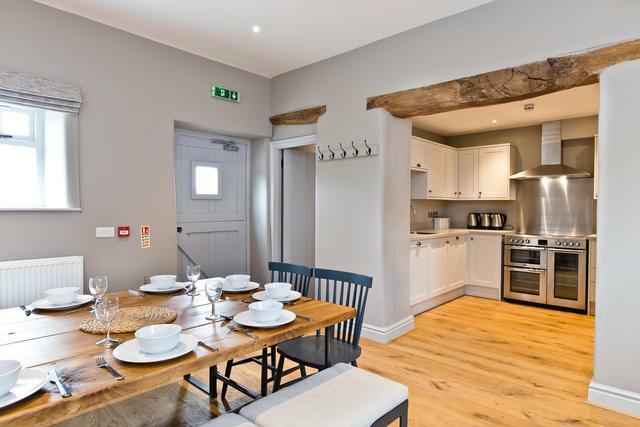 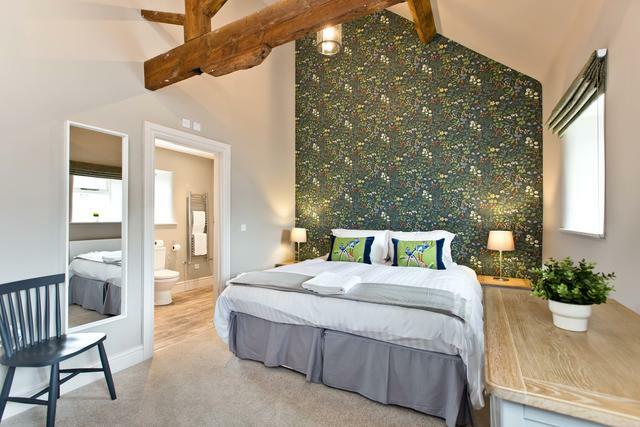 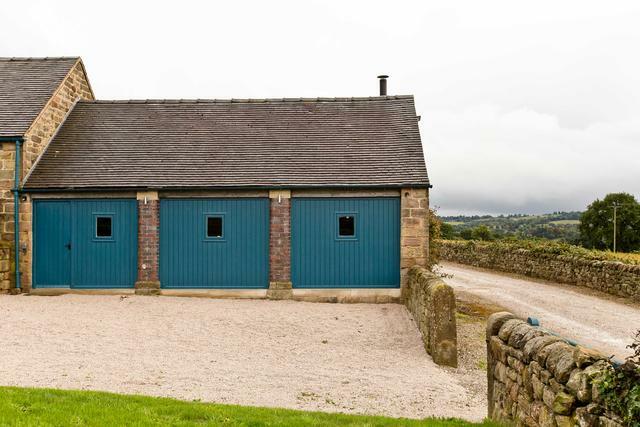 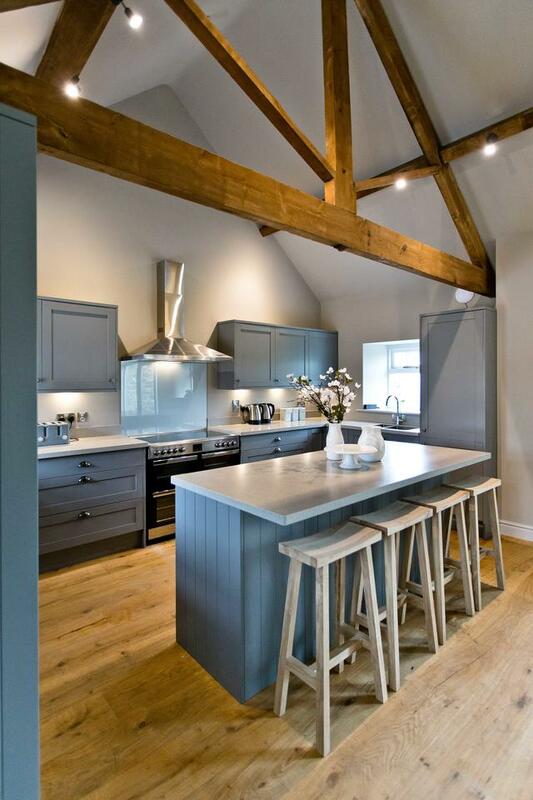 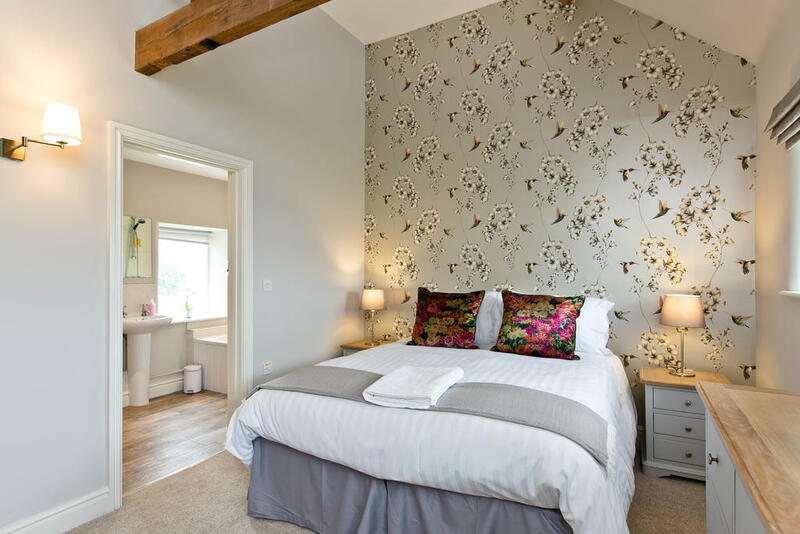 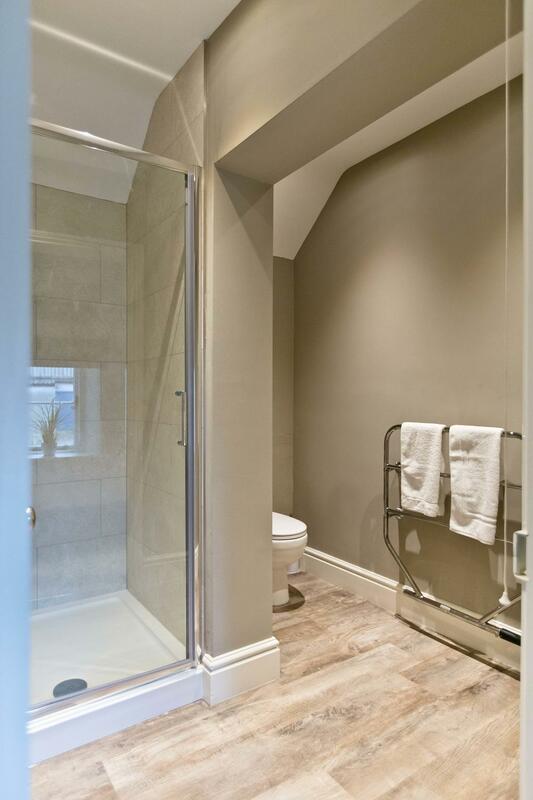 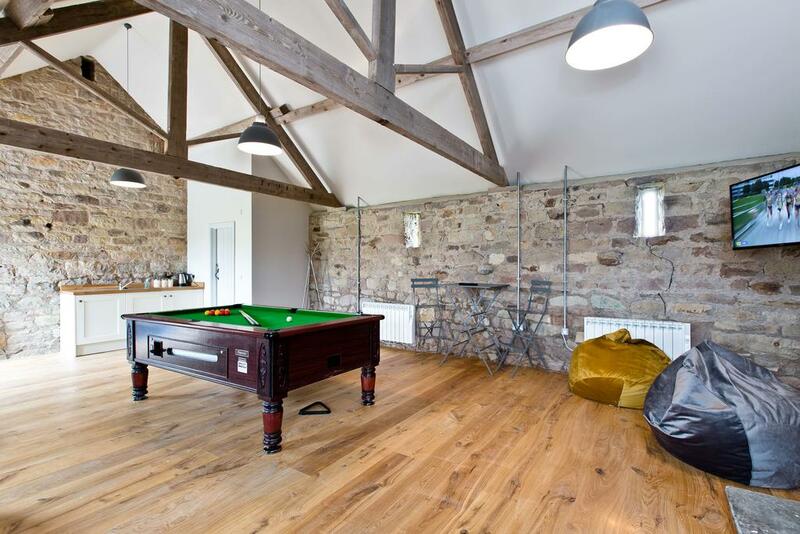 Manifold Barns is a stunning converted barn with a total of seven bedrooms and seven en suites. 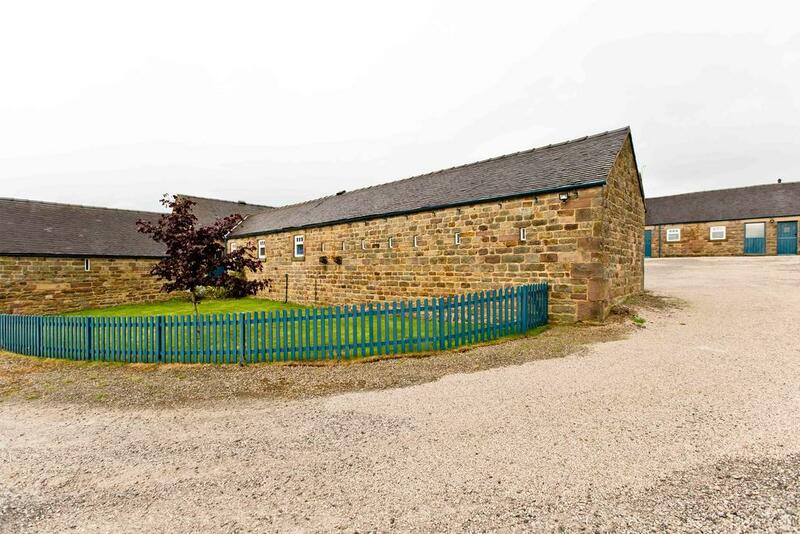 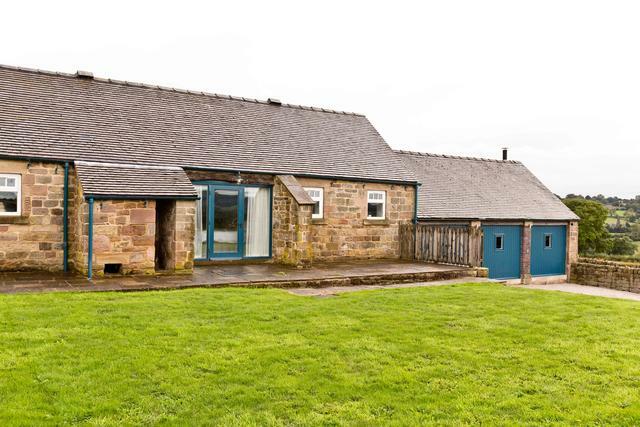 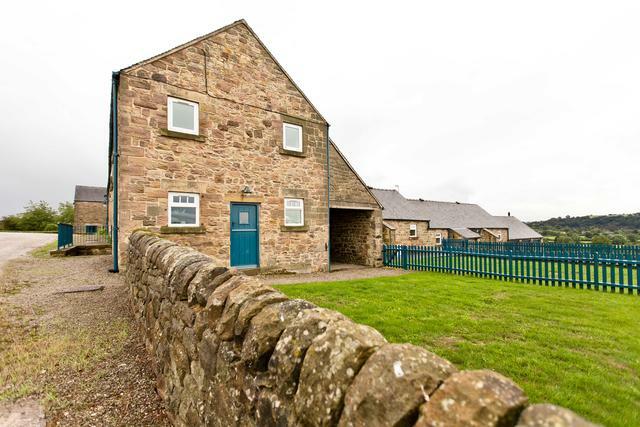 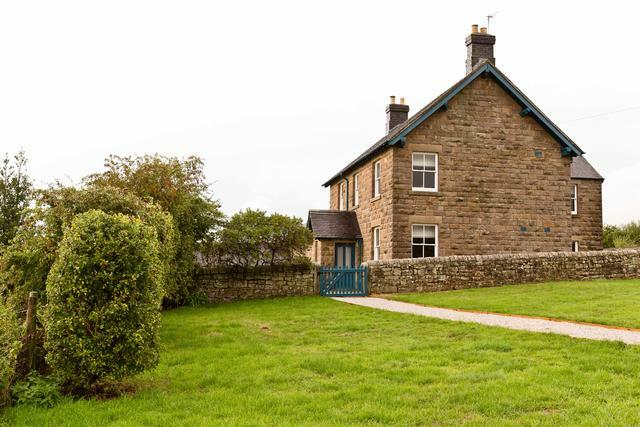 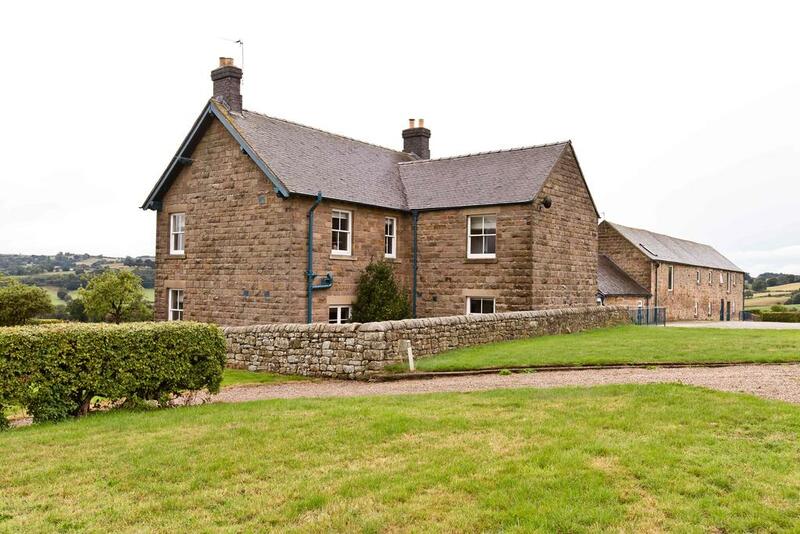 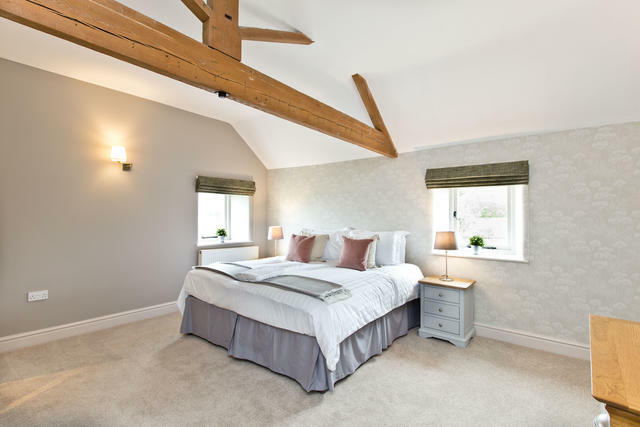 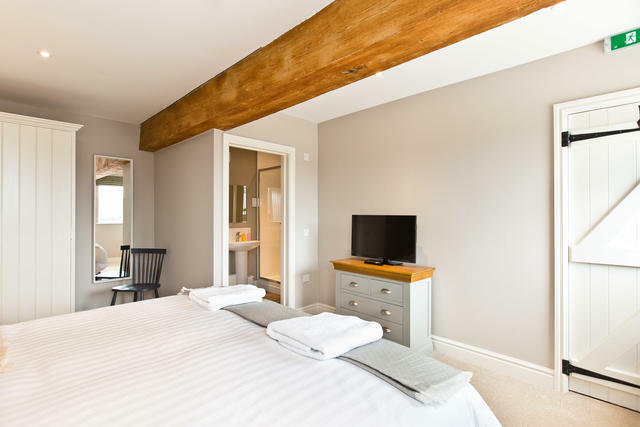 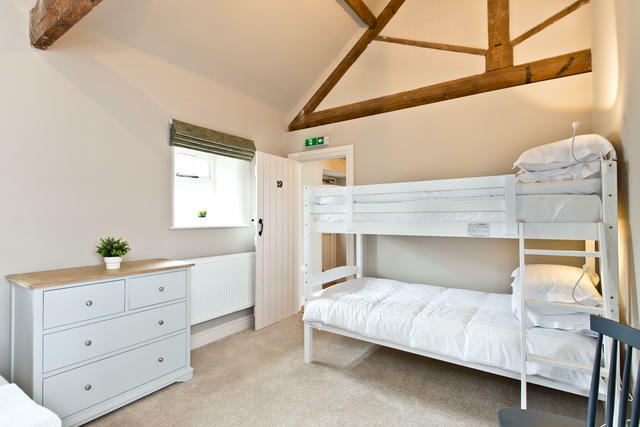 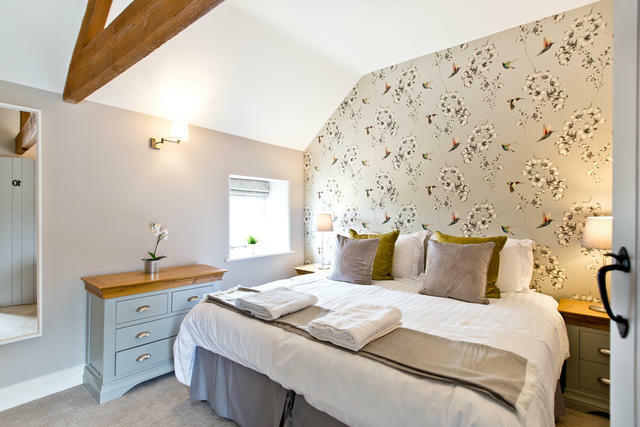 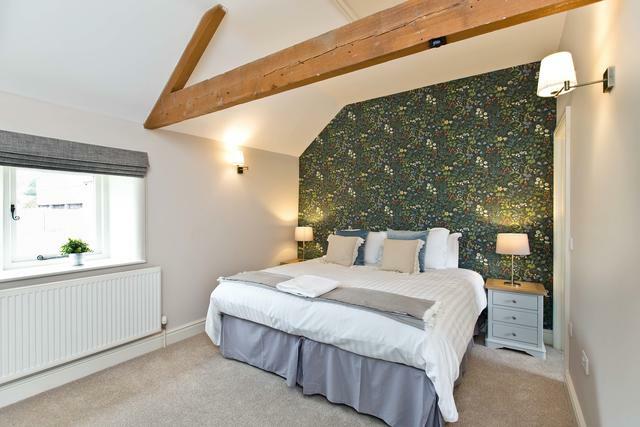 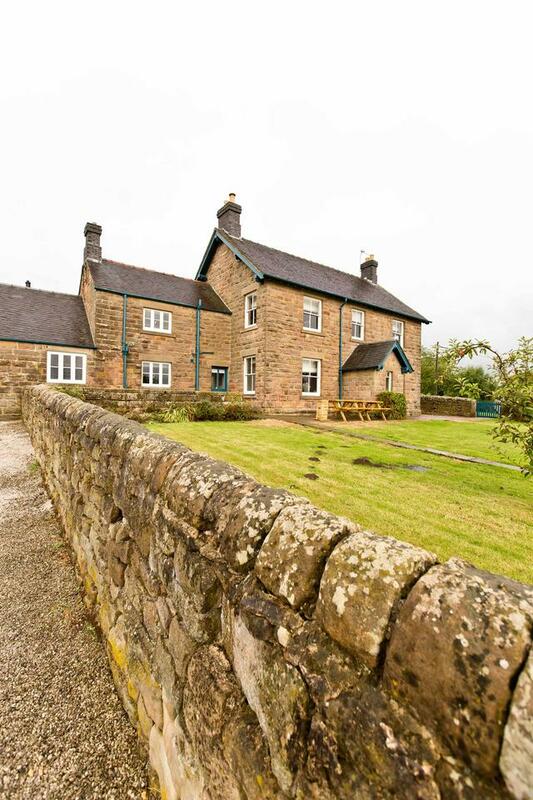 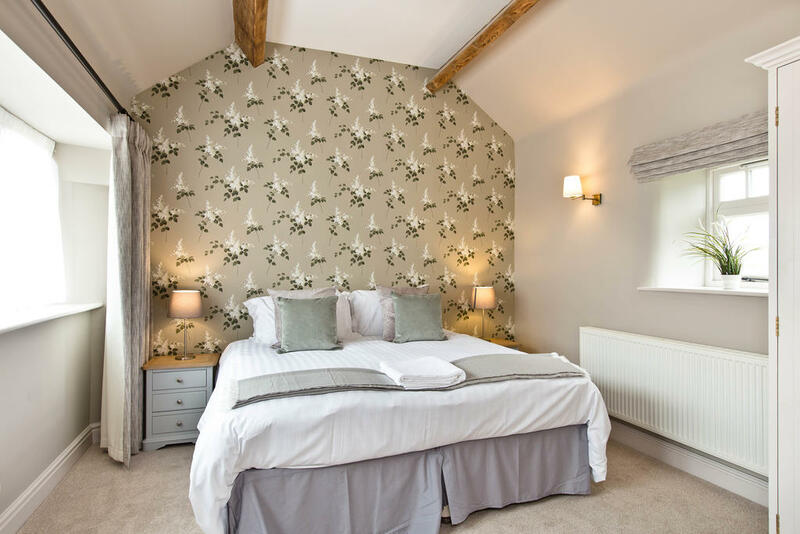 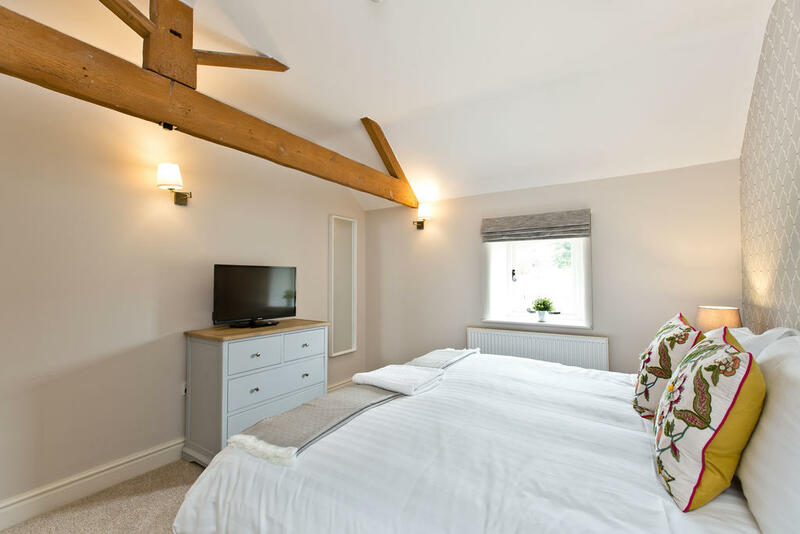 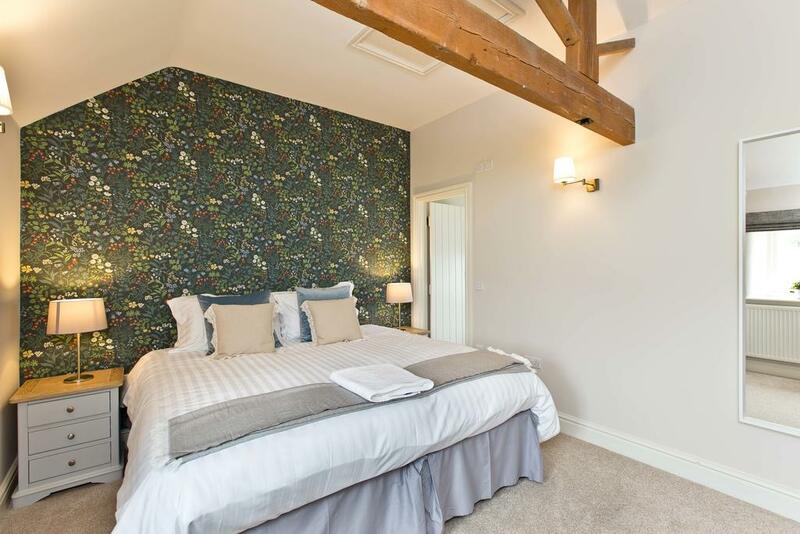 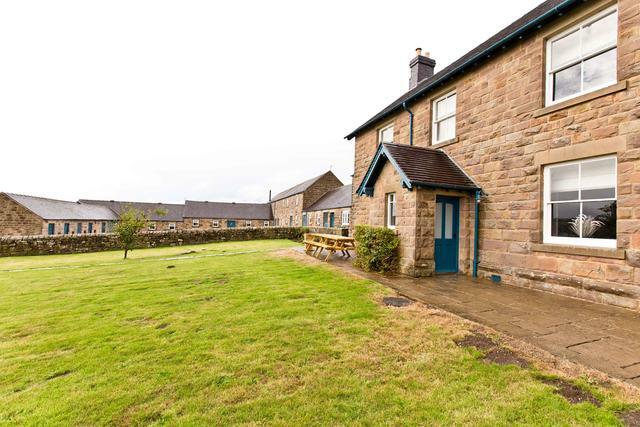 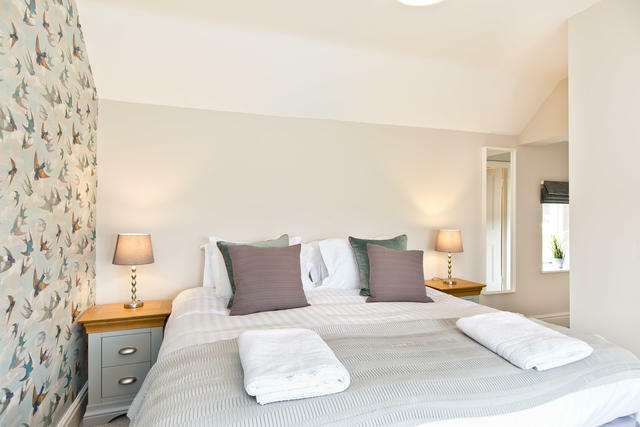 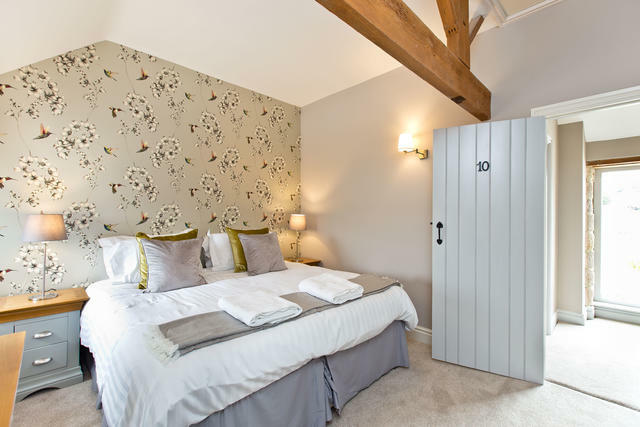 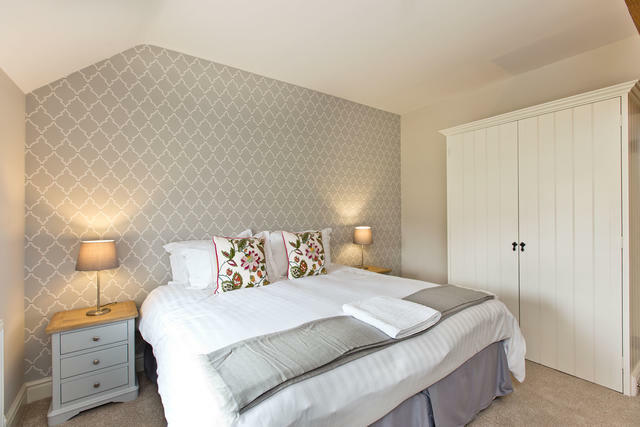 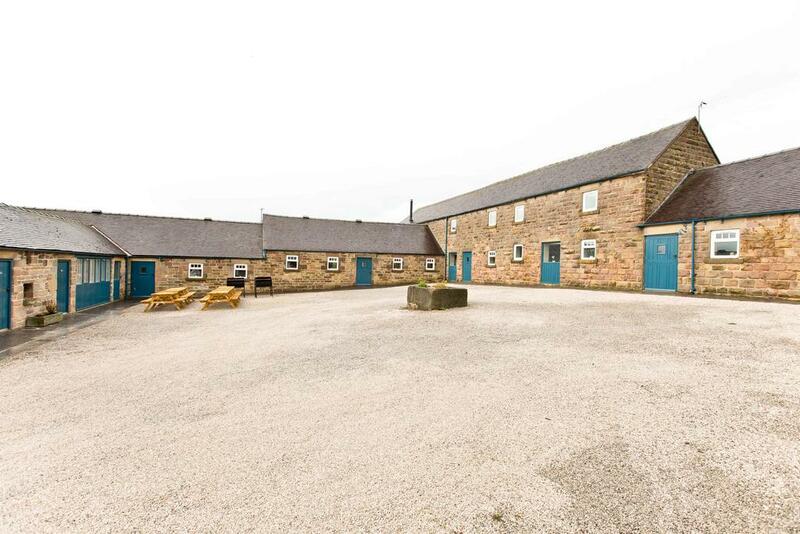 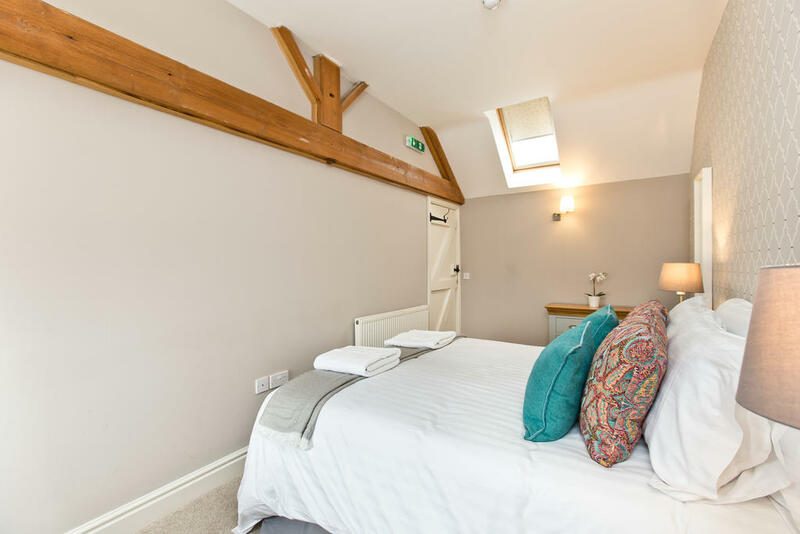 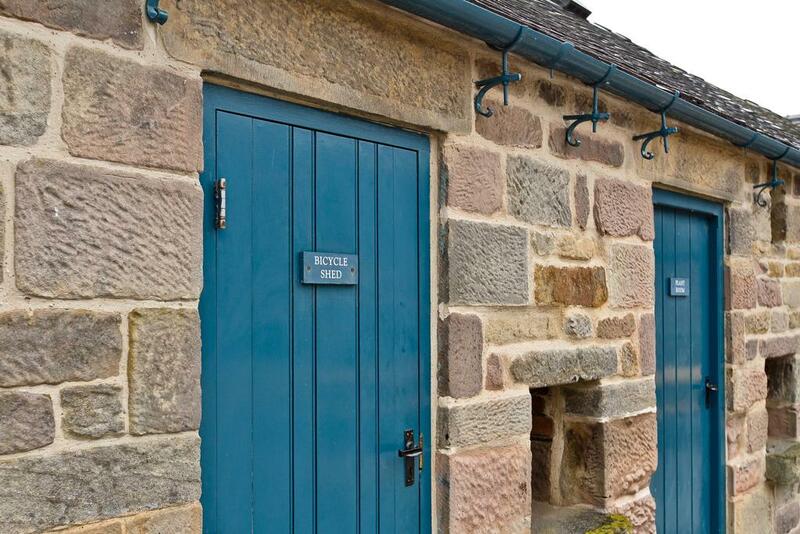 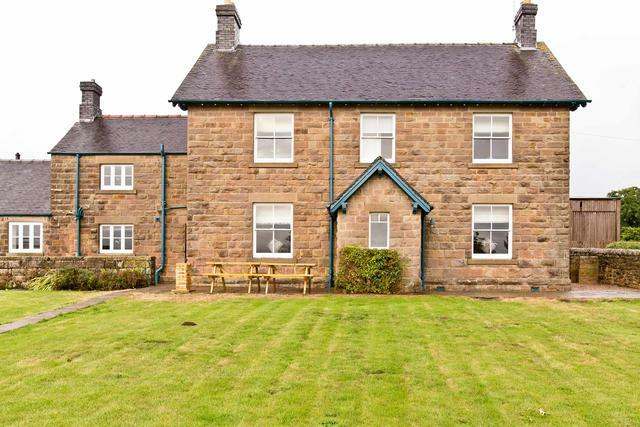 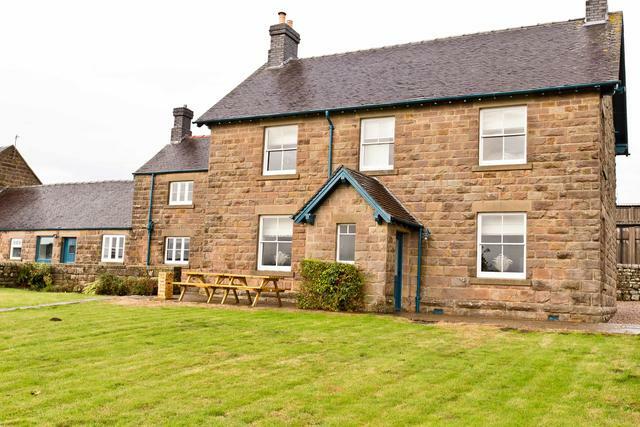 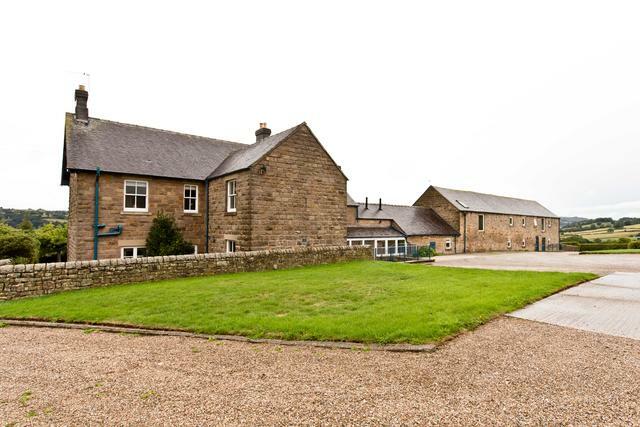 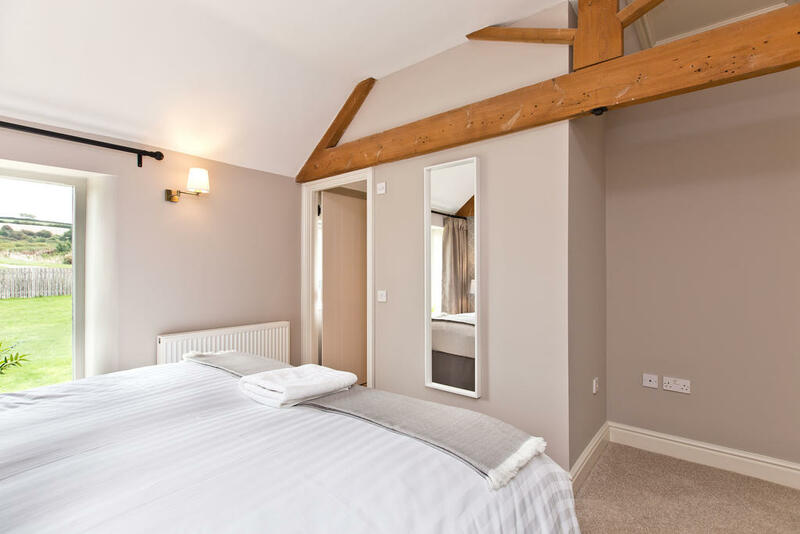 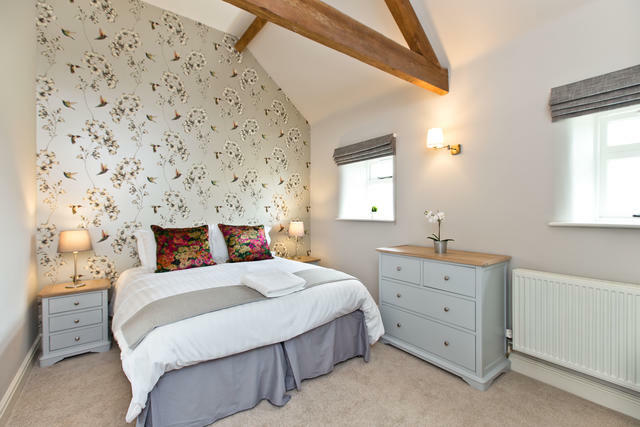 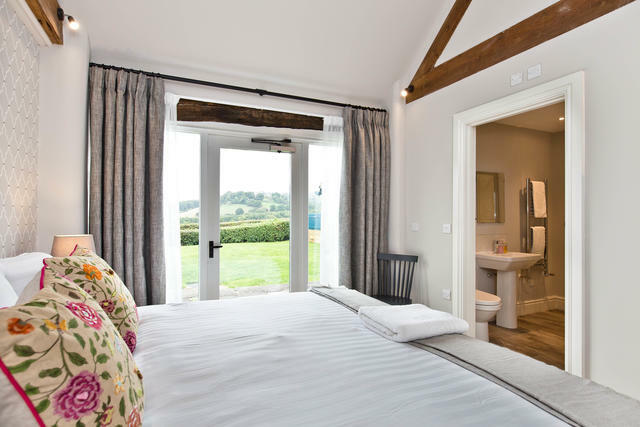 Situated next door is Manifold Barns Annexe with four ground floor en-suite bedrooms. 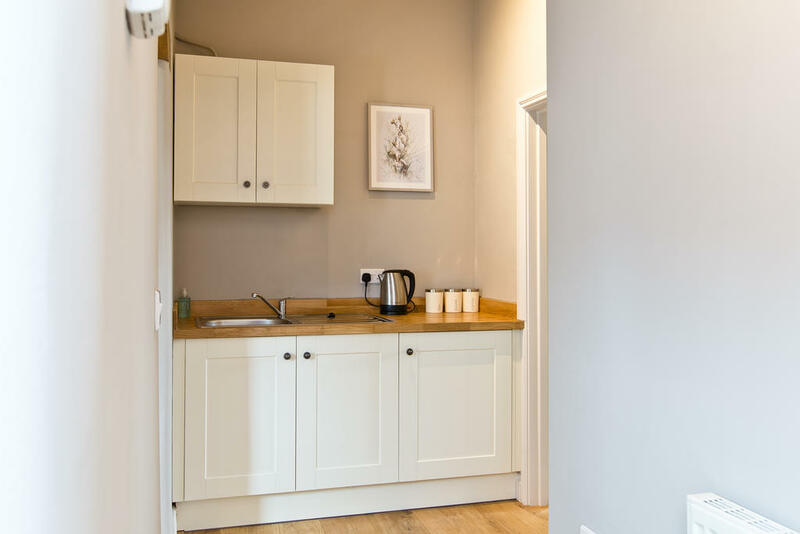 A useful kitchenette for tea/coffee making is provided in the annexe. 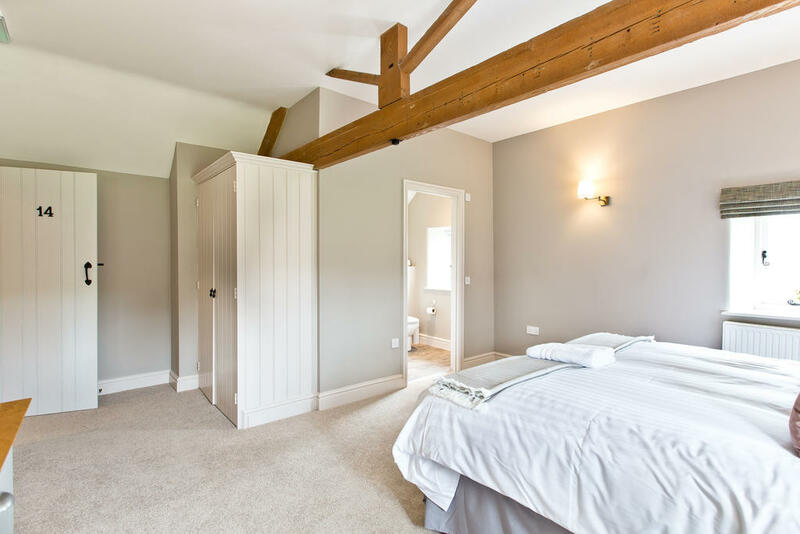 Manifold Farmhouse, this character filled building has seven bedrooms with six bathrooms/ensuites and a further three bedrooms in the wing with two en-suites/bathrooms interconnected by a glass hallway. Please note on the floor plans the room that is not labelled next to Bedroom 2 in Manifold Farmhouse is a Plant Room and therefore has no access. 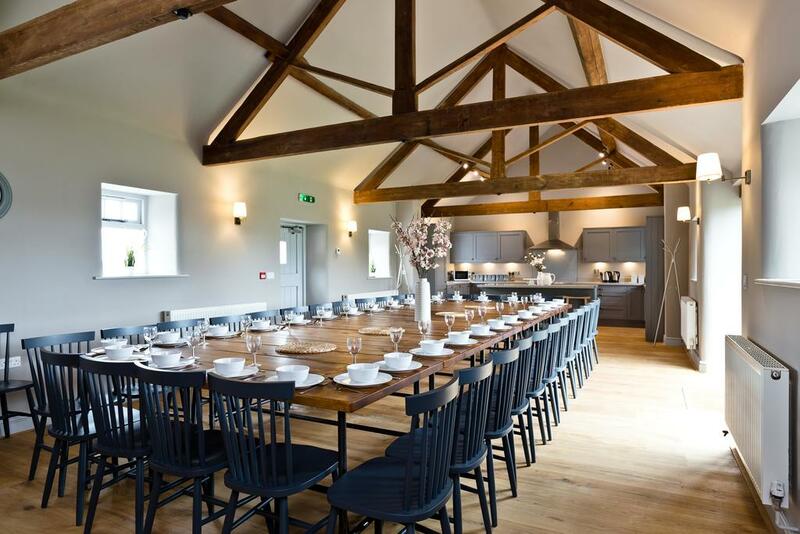 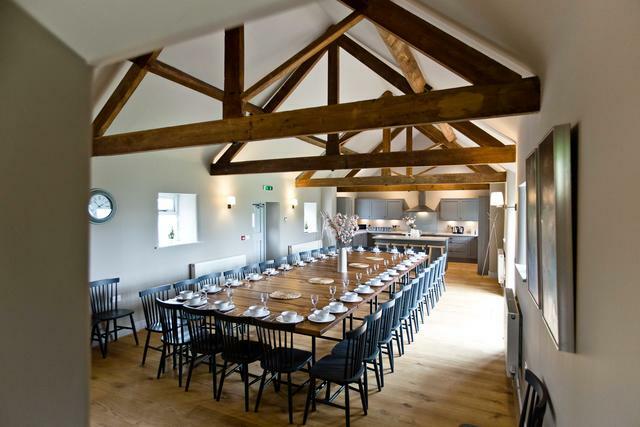 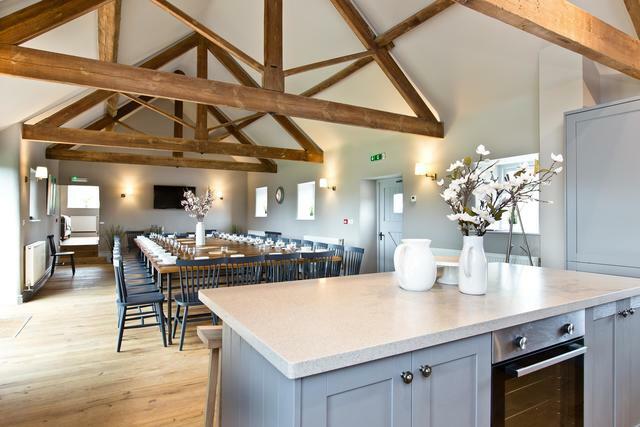 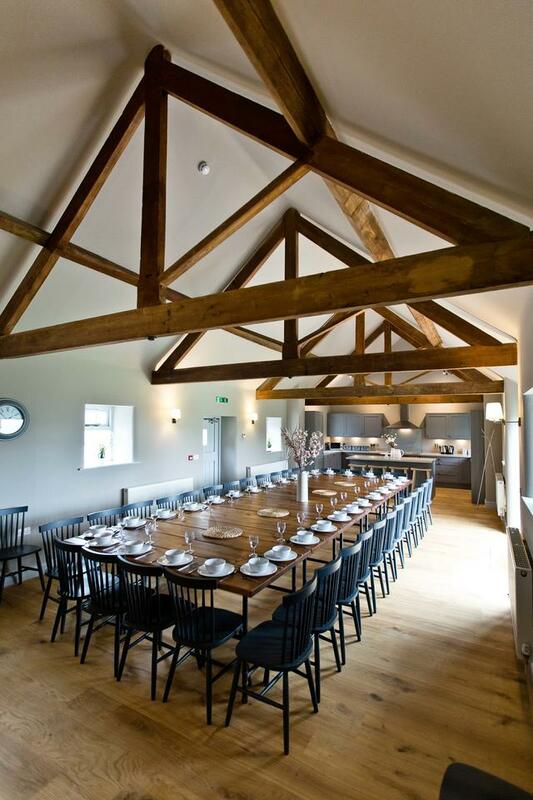 ﻿The main communal dining room is located in The Barn with high beamed ceilings, warm lighting and oak floors throughout. You can dine with a view! 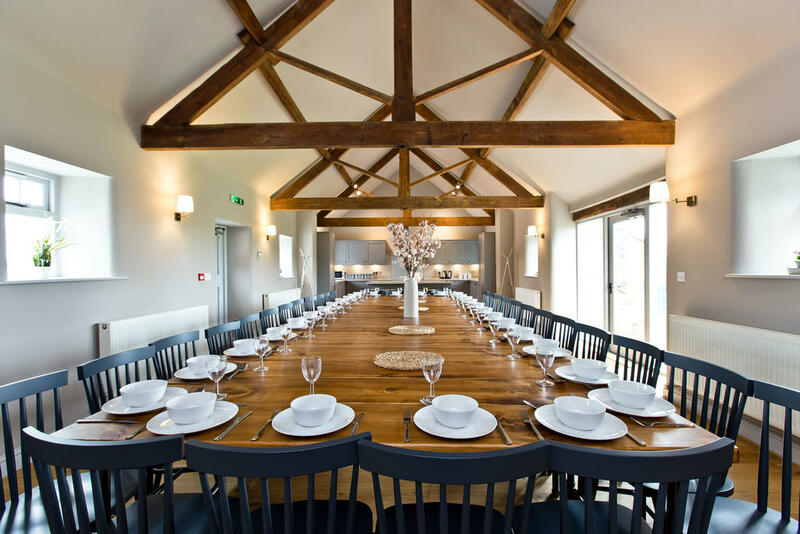 With large glass doors enjoying staggering uninterrupted views of rolling hills and offers flexible dining arrangements for up to 48 guests. 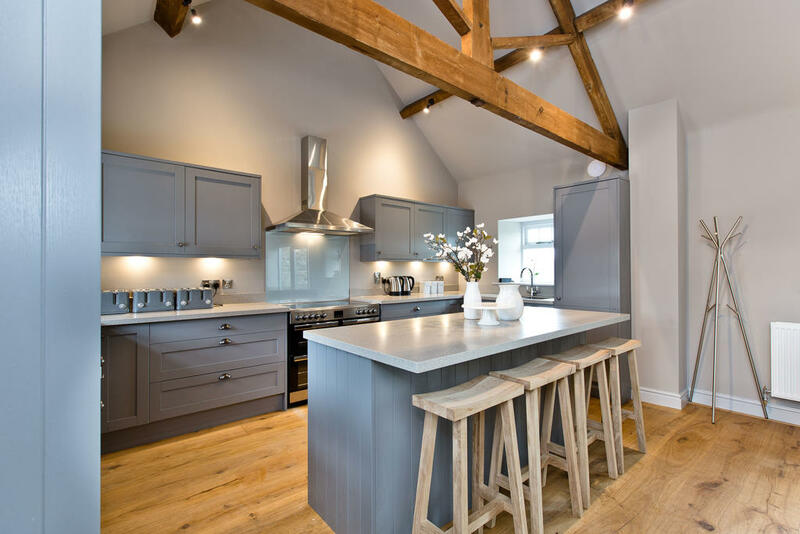 The stunning designer kitchen leads off this amazing space and is fully kitted out with a bespoke range of modern units which incorporates a generous island with stool seating. 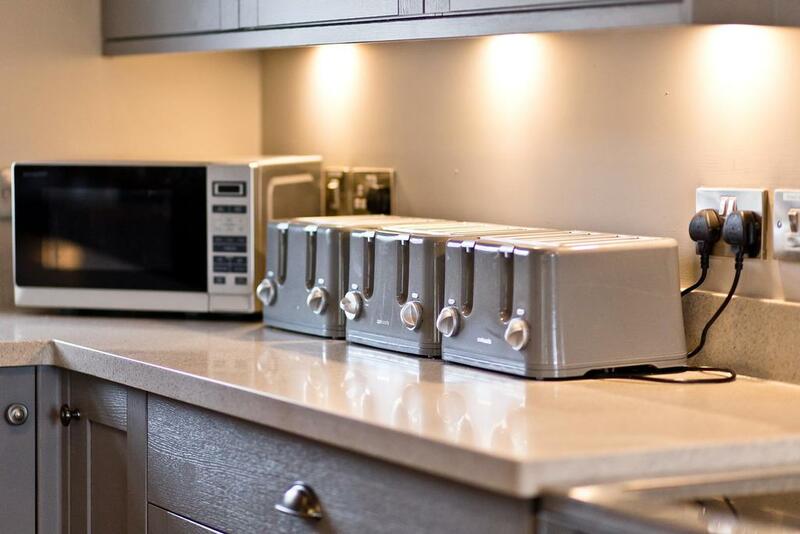 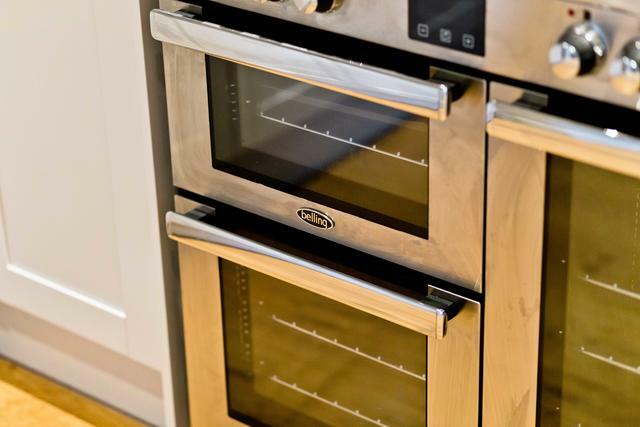 The kitchen is well stocked with all the equipment and mod cons required to cater for large groups of guests. 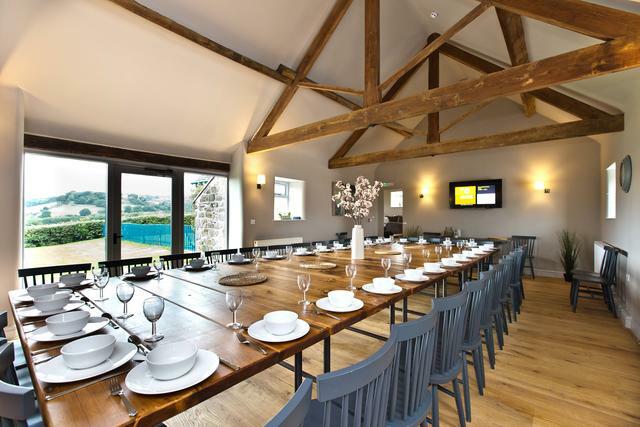 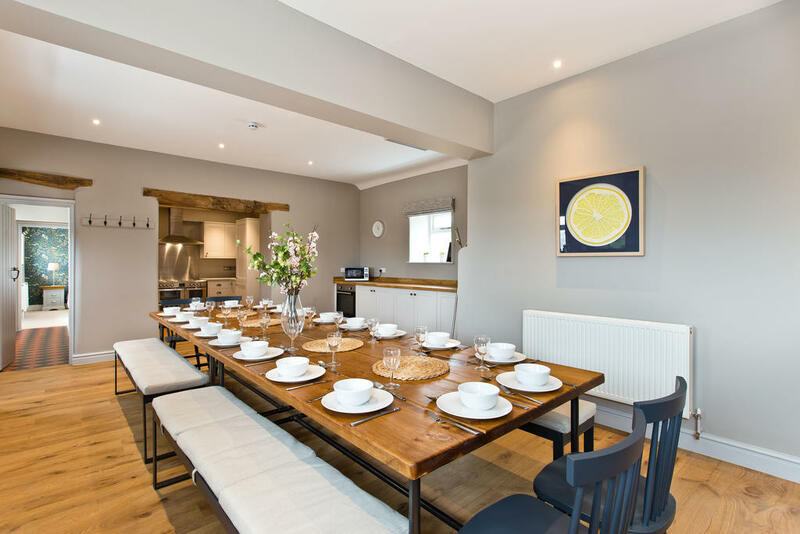 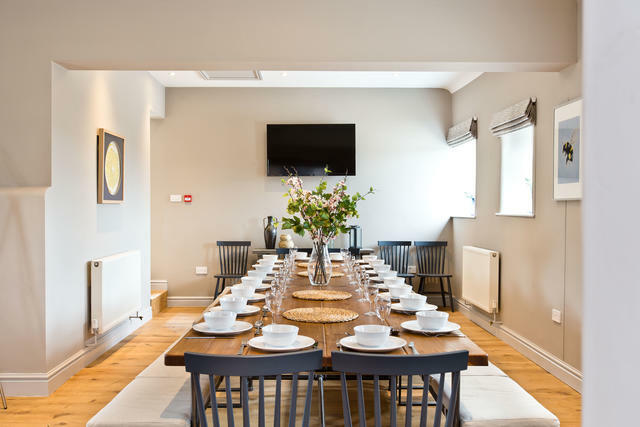 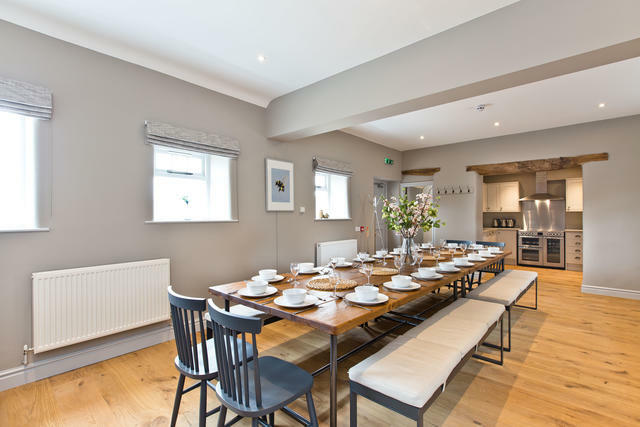 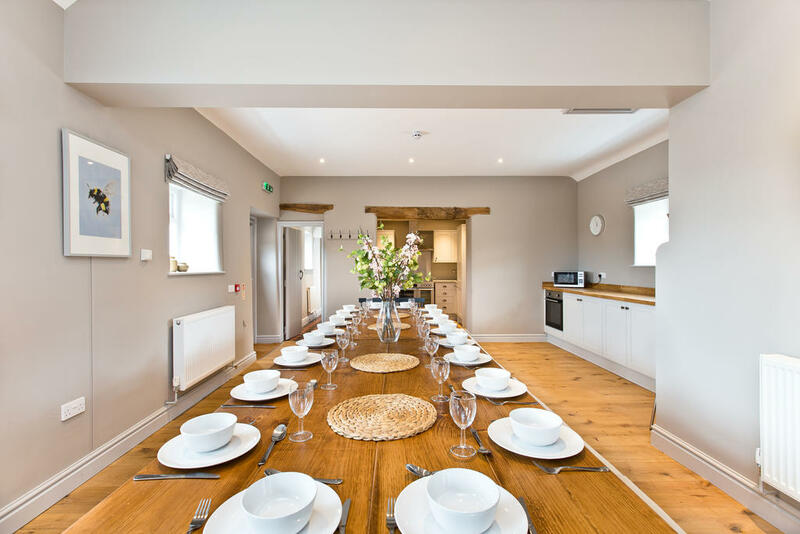 A second alternative dining room and a fully equipped kitchen is located in The Farmhouse with dining for up to 20 guests. You can choose to totally self cater or we can recommend outside catering companies and private chefs. 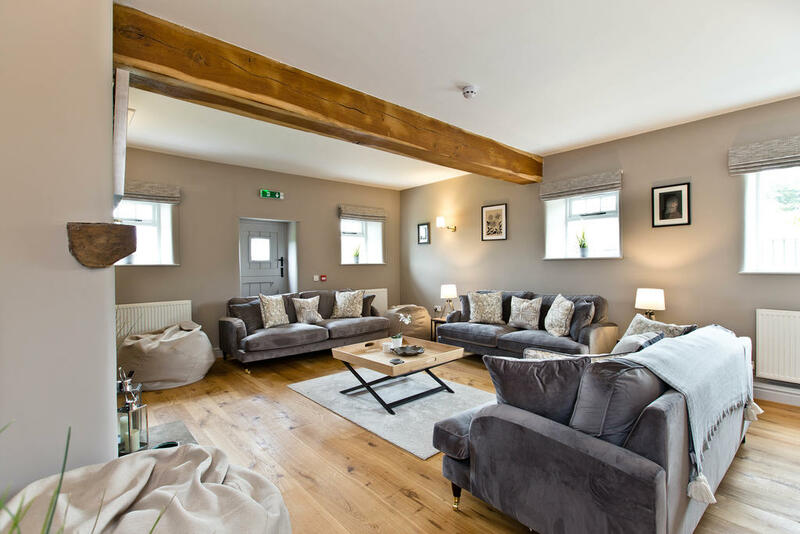 After a day exploring the surrounding area and the Peak District, you can choose to relax in one of the three beautiful lounges located throughout the venue. The Barns has a cosy sitting room which leads off the dining room while The Farmhouse has two additional lounges. 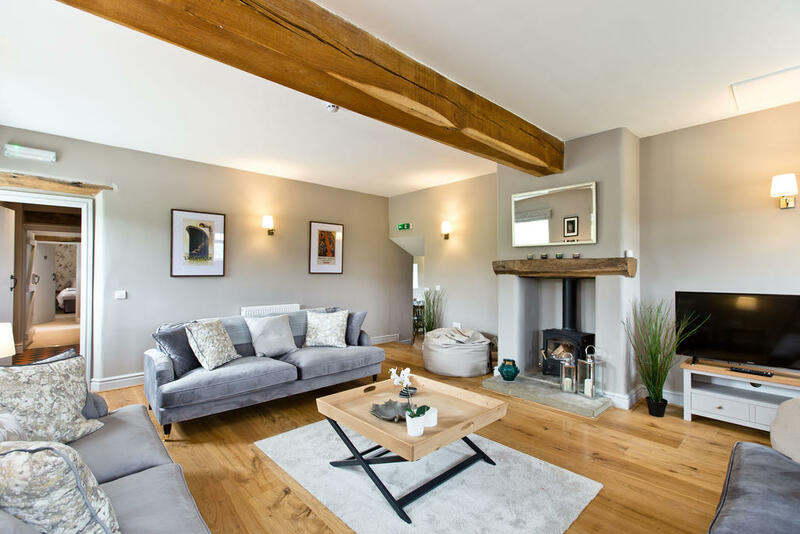 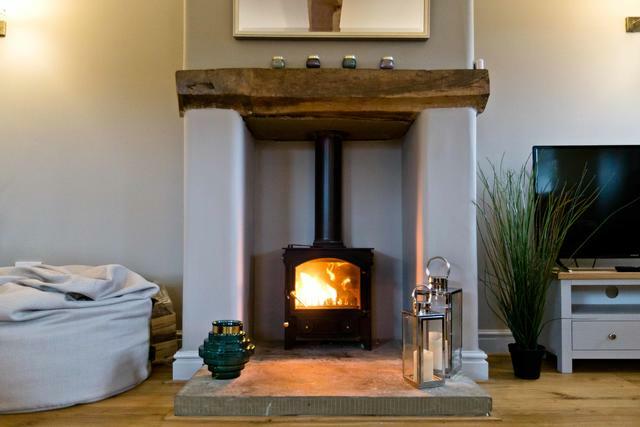 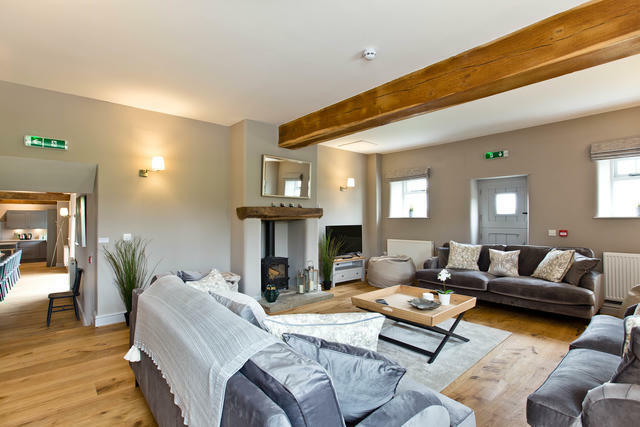 All three lounges have soft seating, cosy sofas and beautiful feature fireplaces, there is a log burner in the Barns lounge and the first Farmhouse lounge has a wonderful working fireplace. 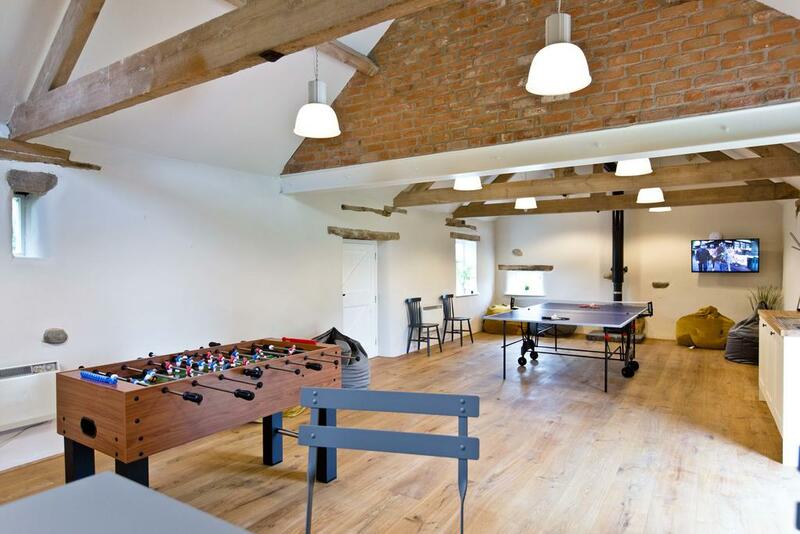 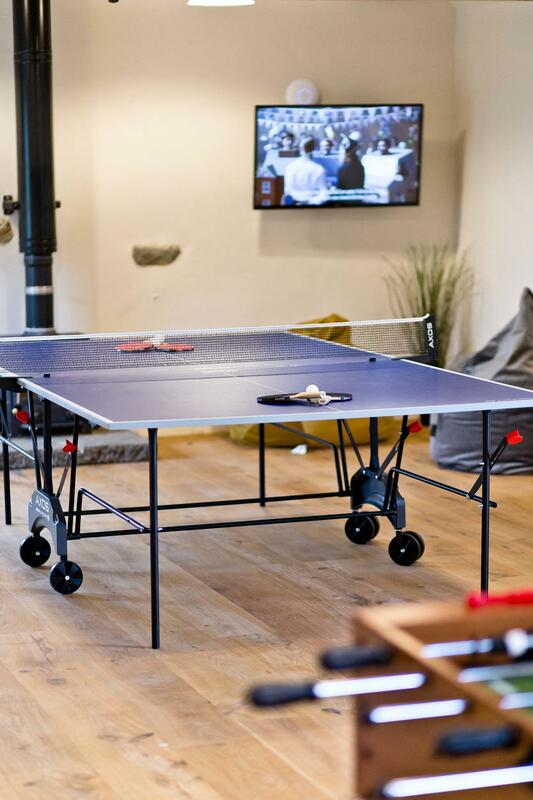 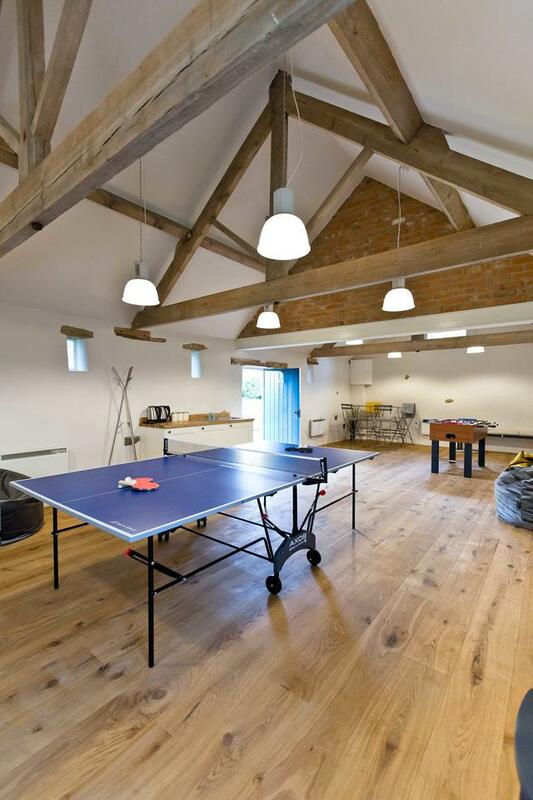 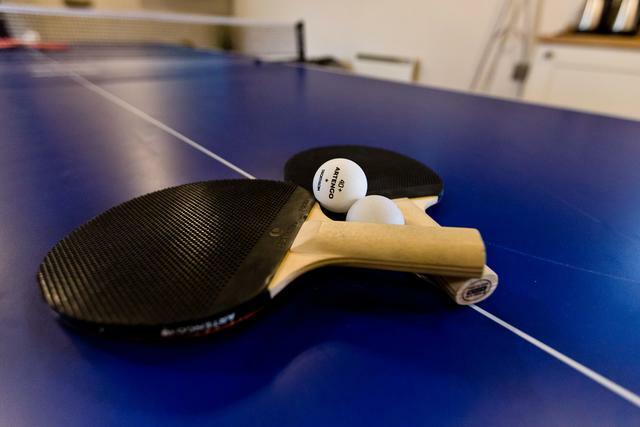 Manifold Farmhouse: A converted barn with exposed beamed rafters and is furnished with a table tennis table and a table football. 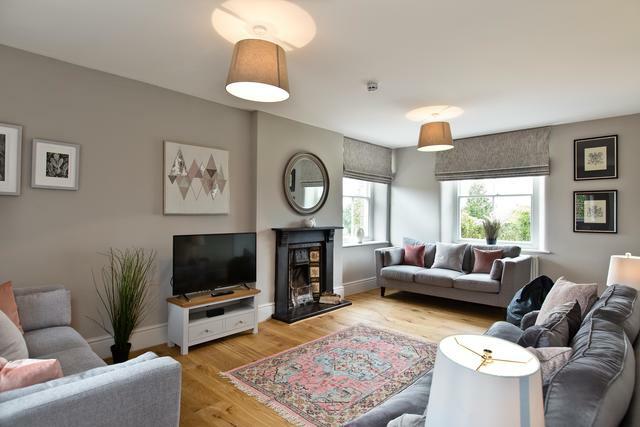 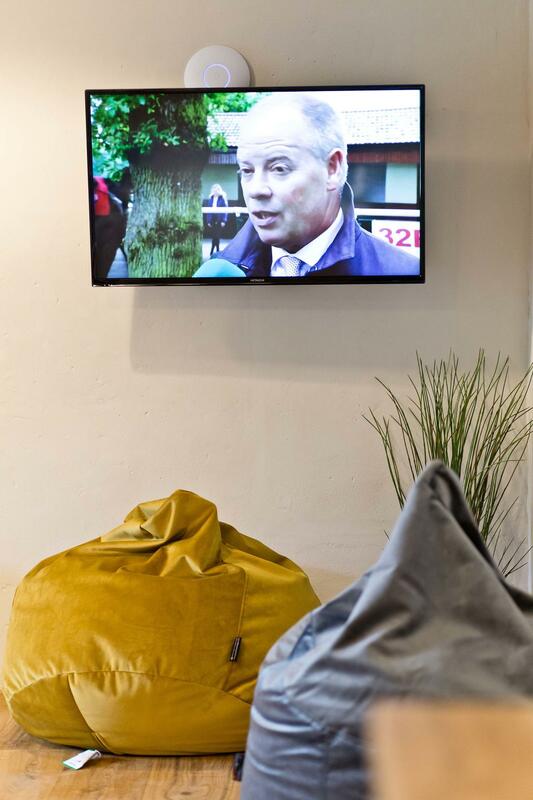 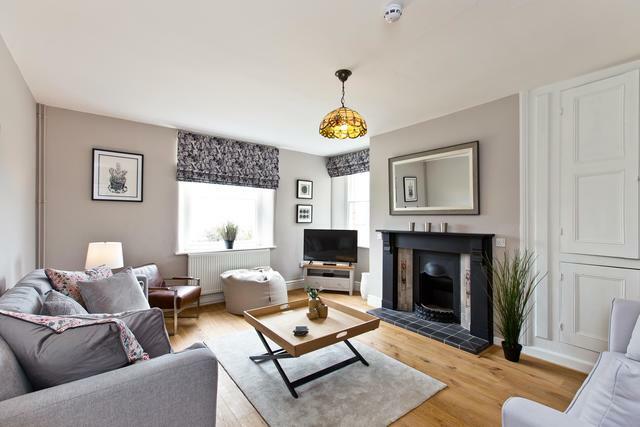 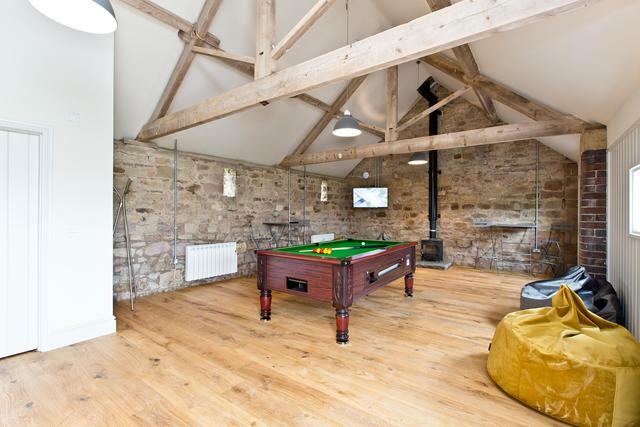 To the far end, sink into huge velvety bean bags in a chill out area with a log burner and a wall mounted TV. 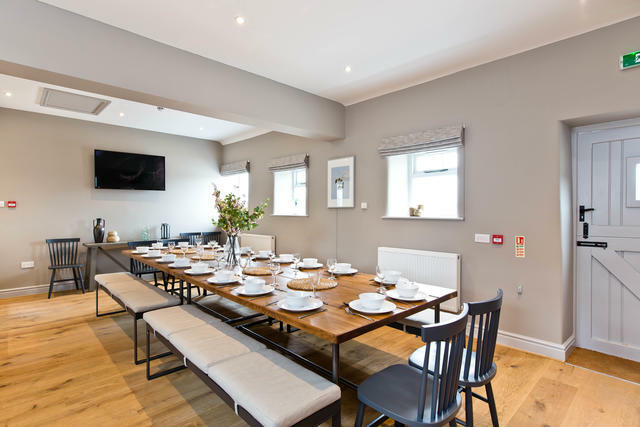 The room is 11.5m x 5m and has been designed to offer a multi functional space - all equipment can be folded away and moved to the edge of the room - perfect for yoga or meetings. 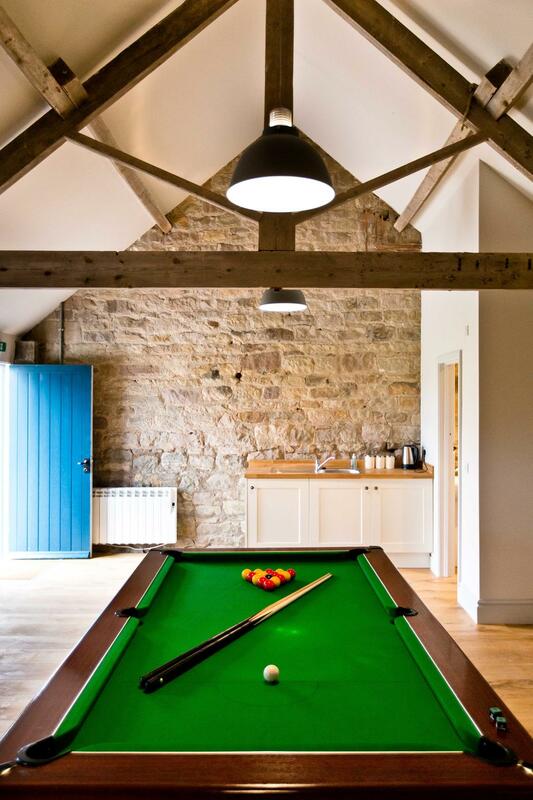 Manifold Barns: A converted stable with exposed stone work and beamed rafters and is furnished with a full-size pool table. 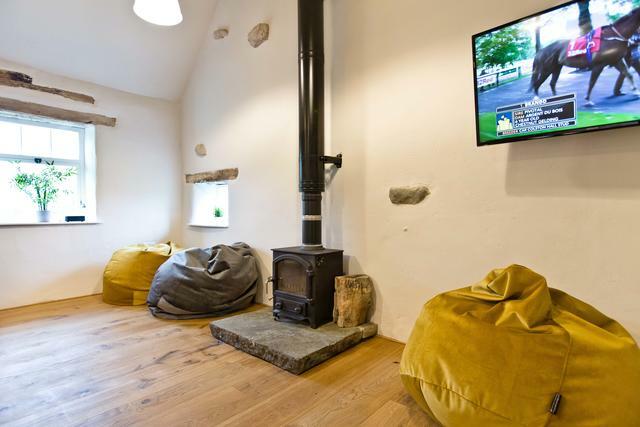 To the far end, sink into huge velvety bean bags in a chill out area with a log burner and a wall mounted TV. 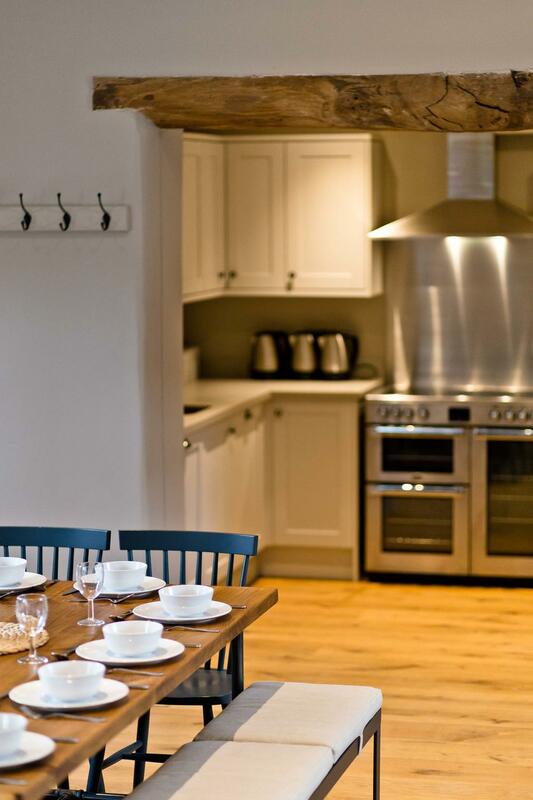 Both games rooms have kitchenettes and wifi. 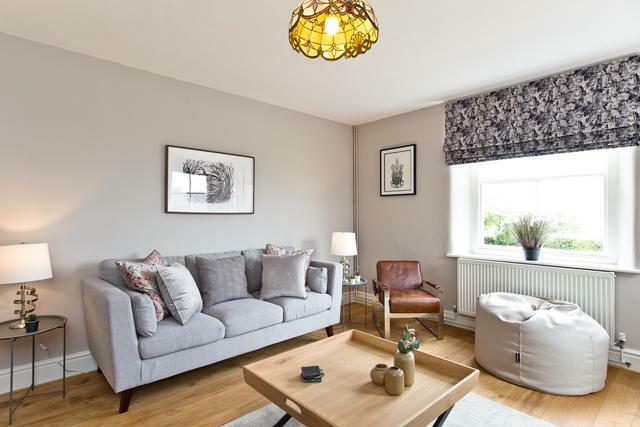 Each property has several garden areas enjoying far reaching views. 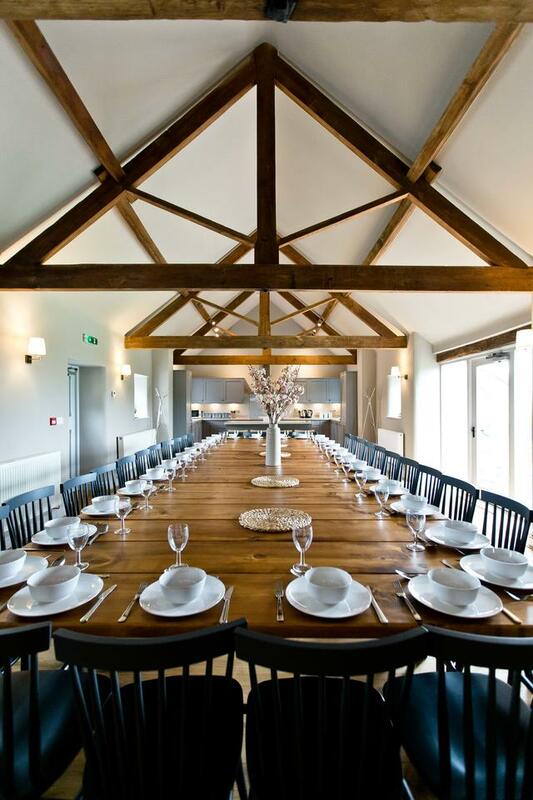 A vast courtyard centrally located in the heart of the venue offers a perfect sheltered spot to enjoy outdoor dining. 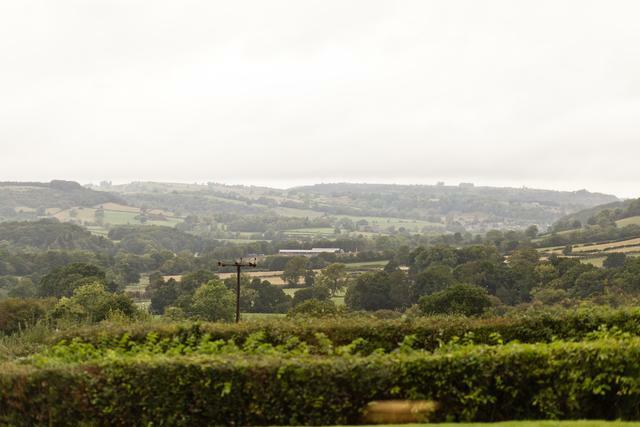 There are plenty of picnic benches and a charcoal BBQ available for use from 01st April through to 31st October, please supply your own charcoal and lighting equipment. Outside to the rear of The Barn is a sizeable patio with lawned gardens and views of rolling hills beyond. 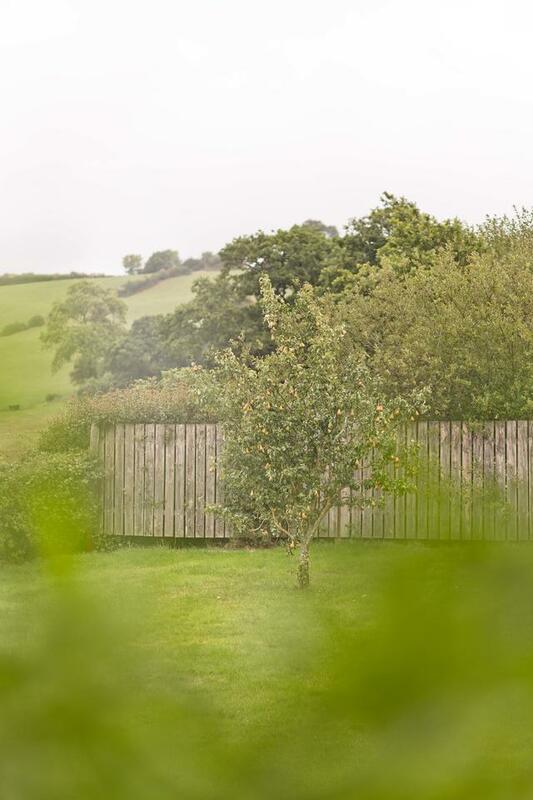 To the front and side of the Farmhouse, are lawned gardens which lends themselves to garden games with an open vista towards the village of Idridgehay. 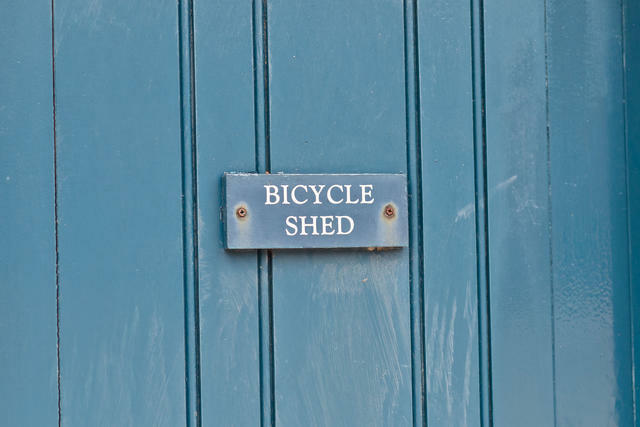 We kindly ask you to respect the peaceful location and our late night curfew of being back inside the buildings by 10pm. 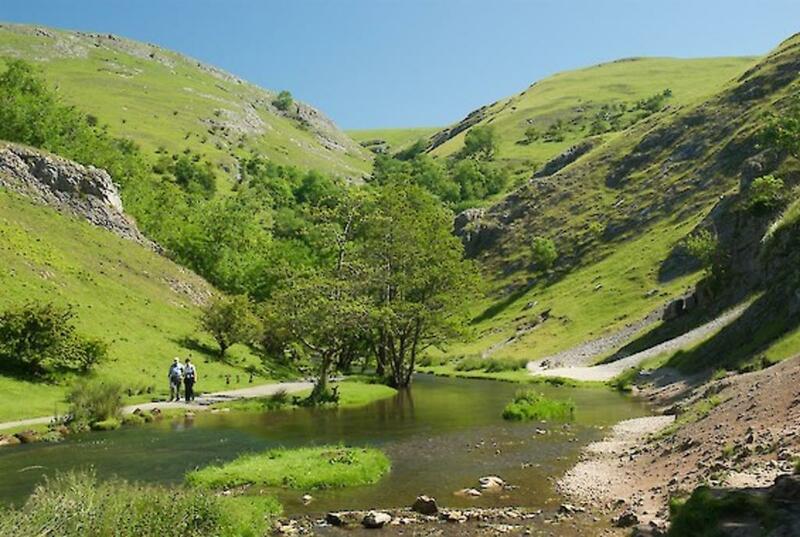 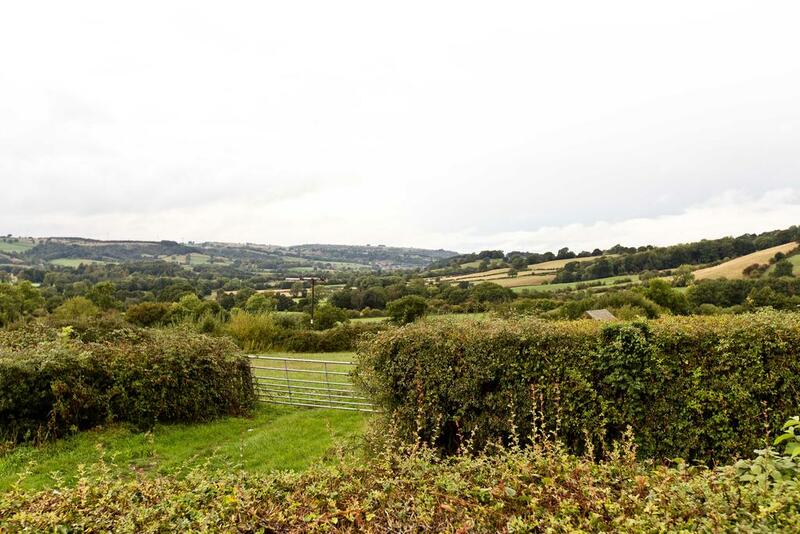 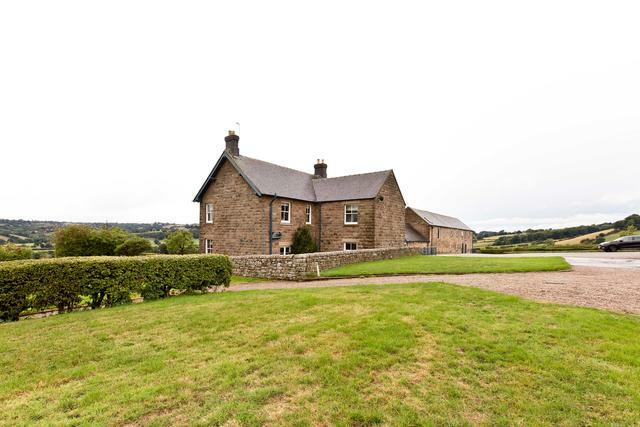 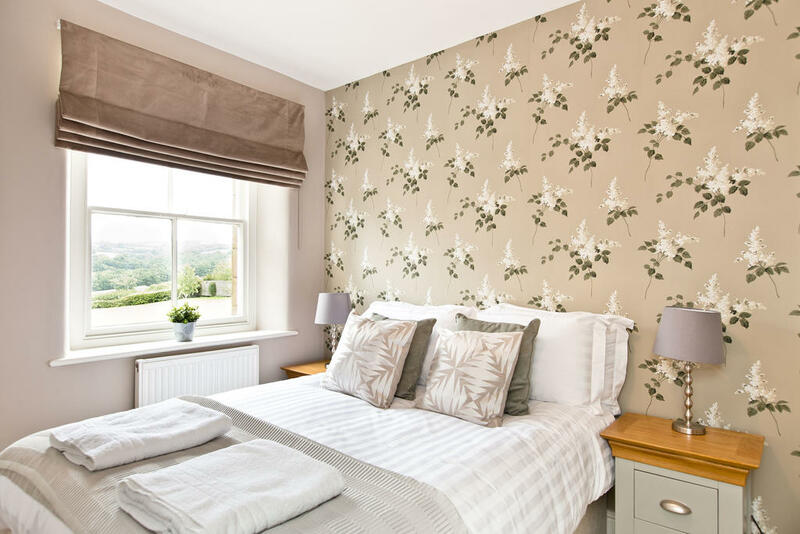 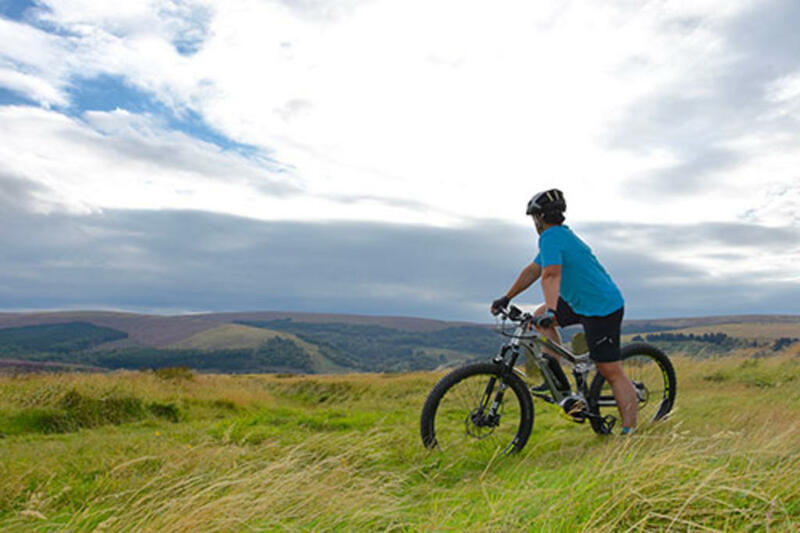 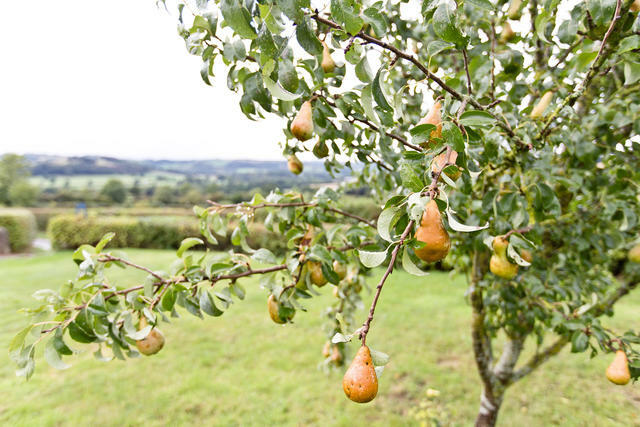 Perched high on a hillside position, Manifold Farm enjoys beautiful views overlooking the Derbyshire valleys. 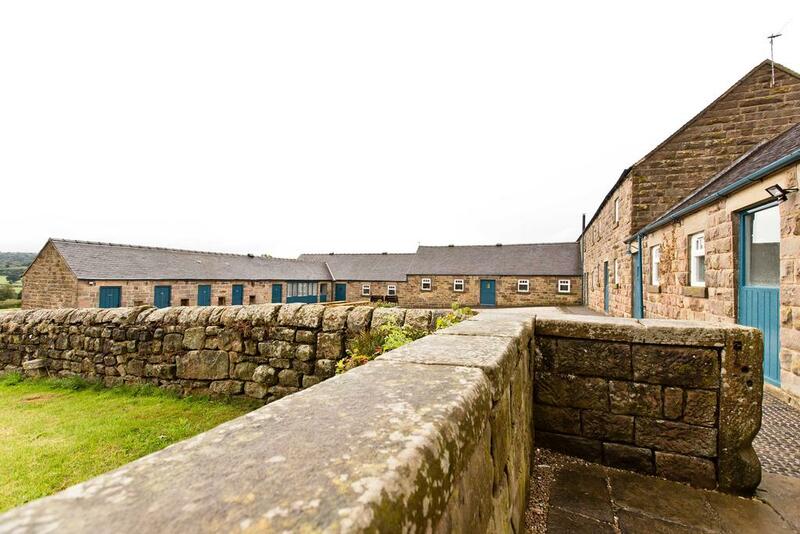 The former working dairy farm is steeped in history yet the contemporary style blends seamlessly to provide a cleverly converted cluster of stone-built cottages, barns, stables and farmhouse around a courtyard setting. 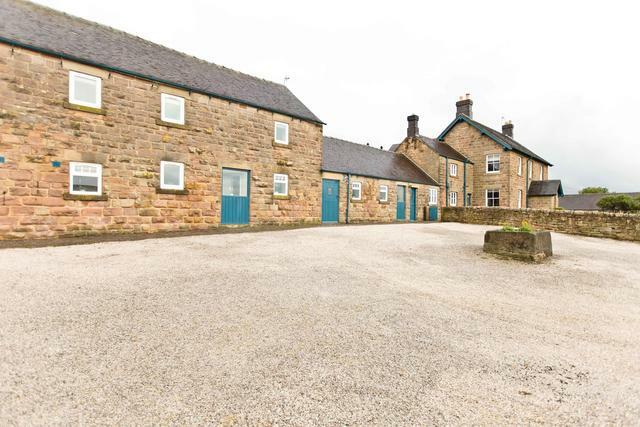 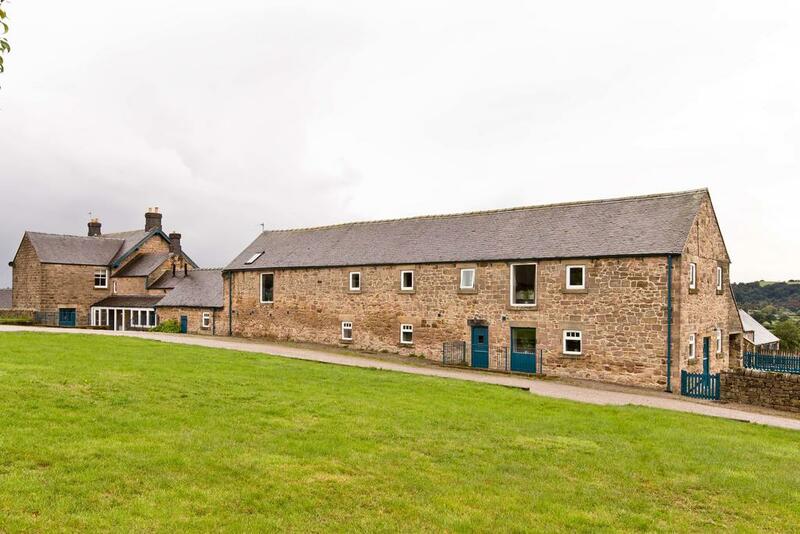 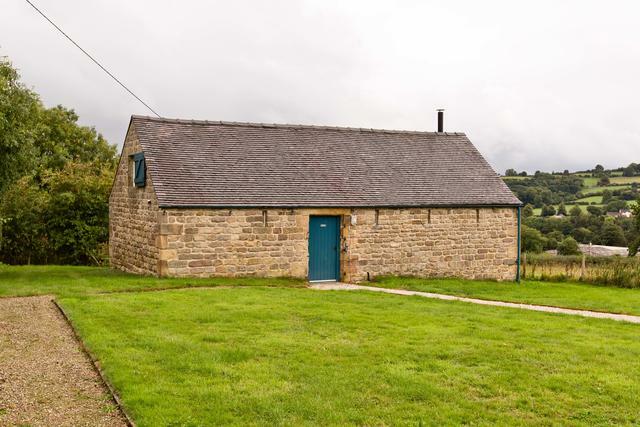 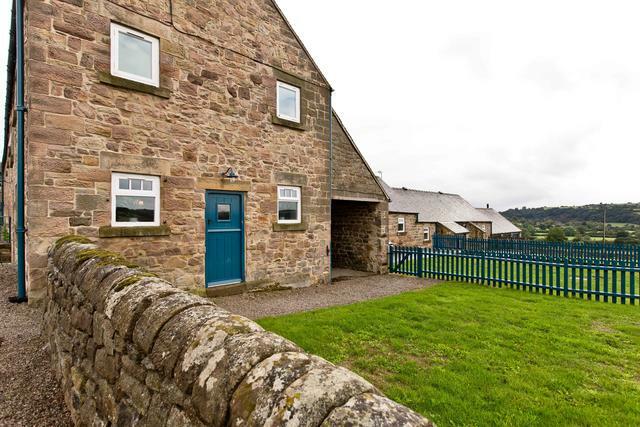 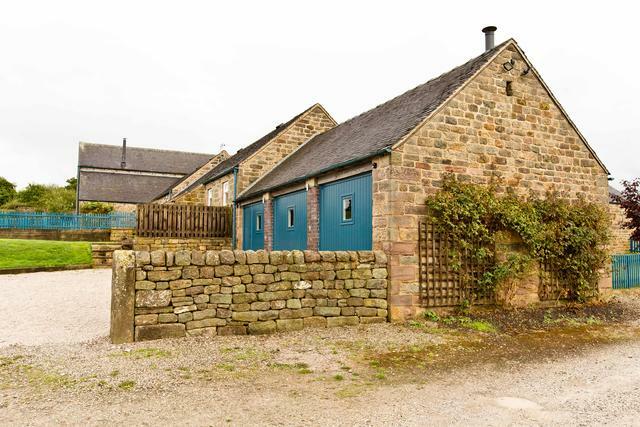 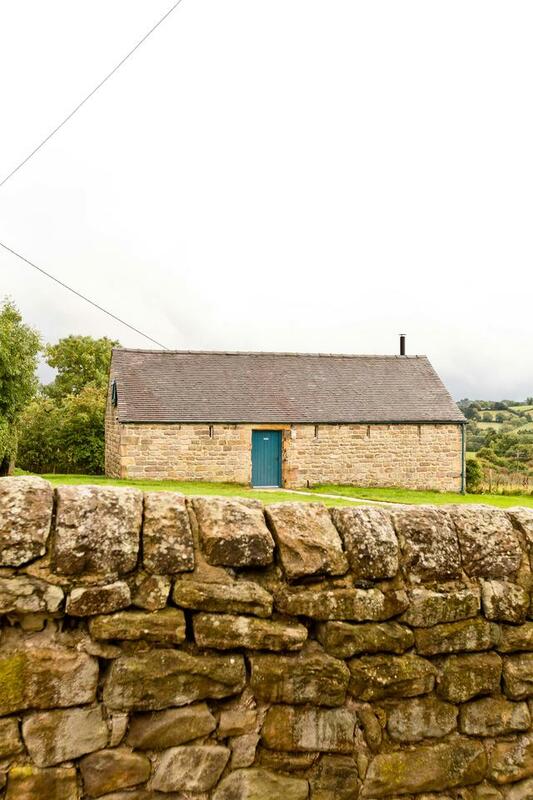 Manifold Farm is part of the rural hamlet of Shottle located in lovely rolling countryside, on the southern borders of the Peak District National Park. 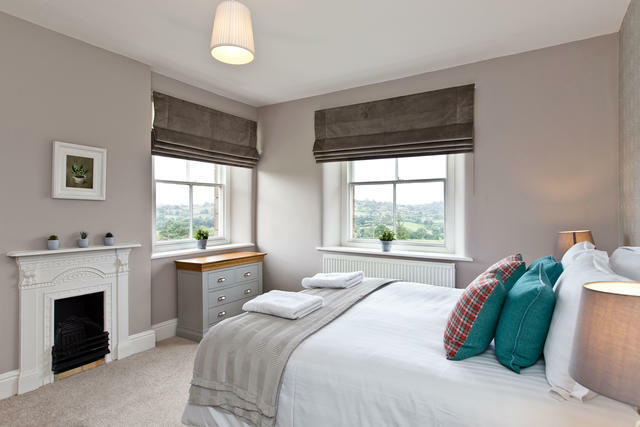 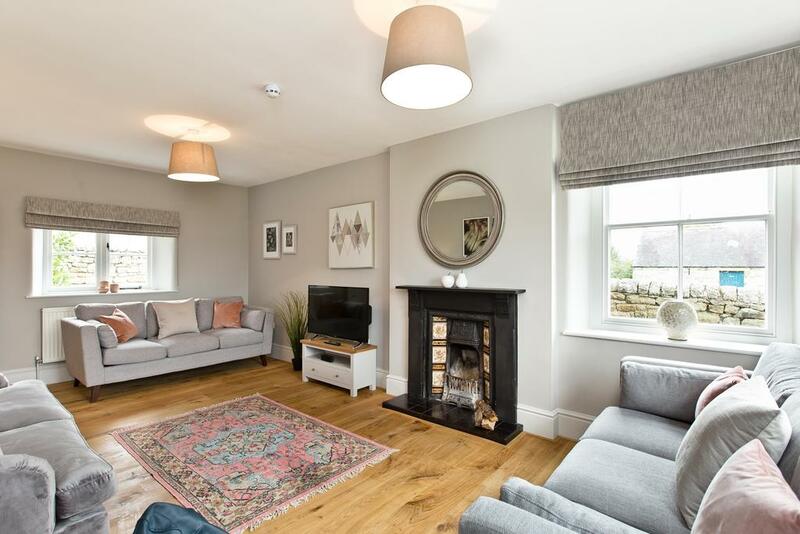 Nearby Wirksworth is a small yet charming market town on the edge of the White Peak and is full of character, and a real gateway to the Peak District. 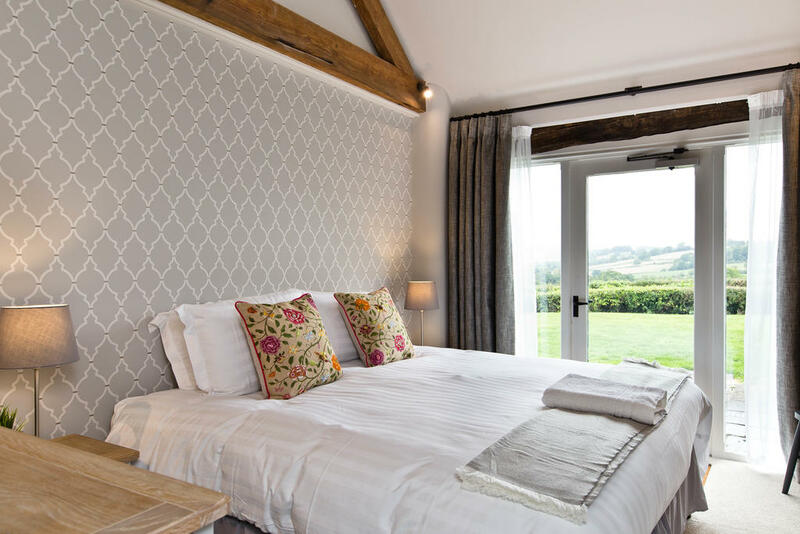 • If you have booked ‘The Barns’ take the first entrance, if you have booked ‘The Farmhouse’ please carry on a few metres and take the second entrance. 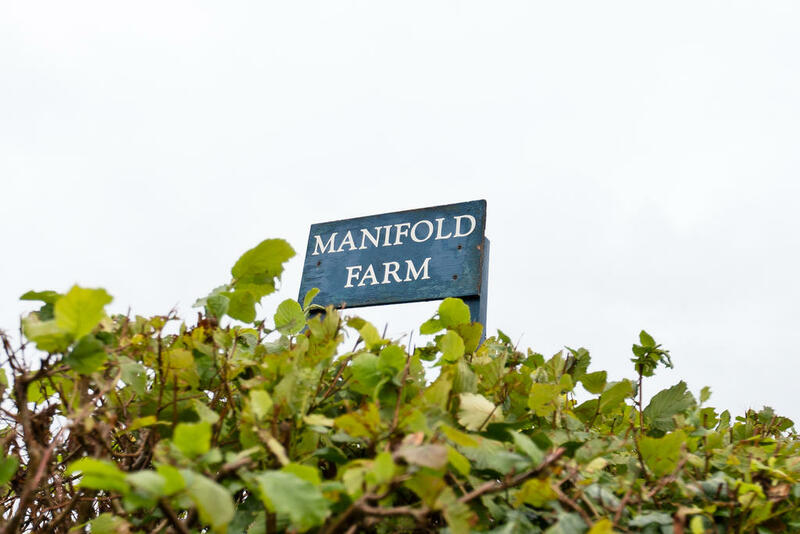 • You have arrived at Manifold Farm! The following comments are taken straight from the guestbook we keep for Manifold Farm. Verbatim. 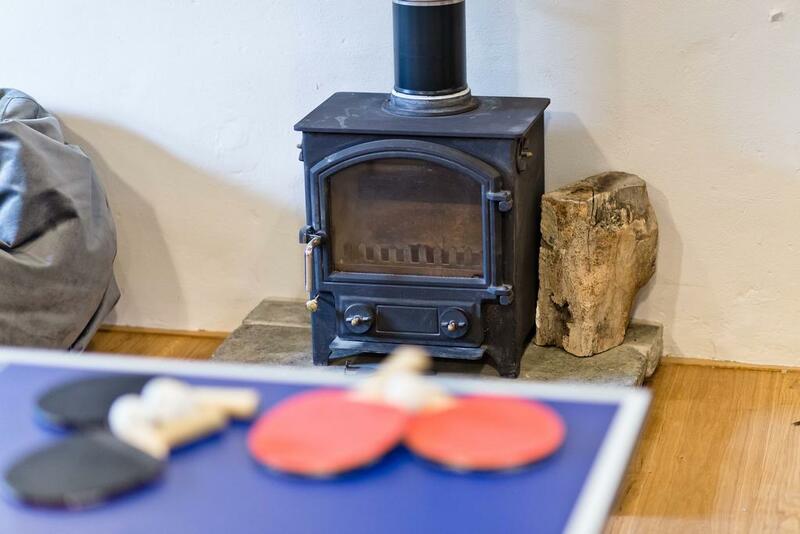 Just a quick email to thank you for hosting us. 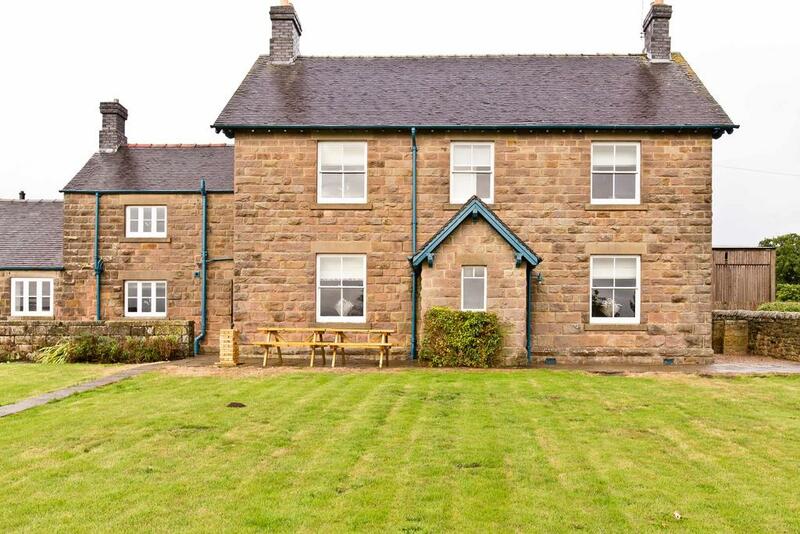 We had a fantastic time and the house was just perfect for our needs. 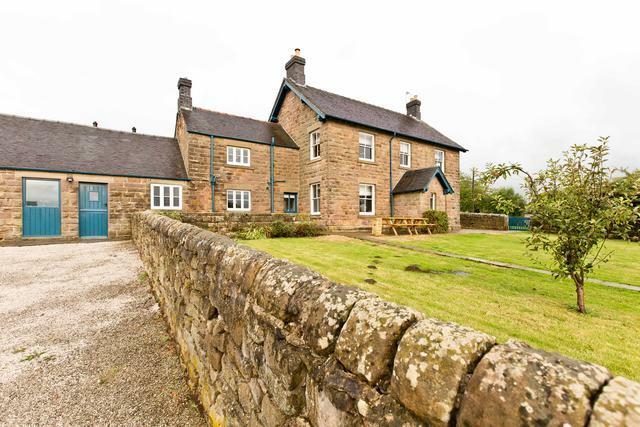 In fact, this has been the best house we have been in terms of location, cleanliness and layout. 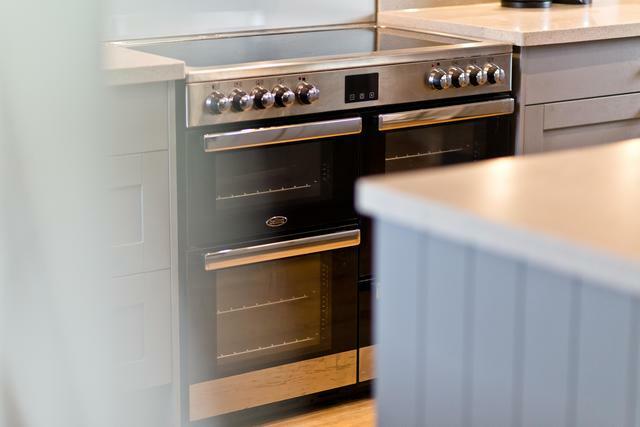 We do this every year so no doubt I will contact you again next year. An award-winning tramway museum, buy a ticket and take unlimited trams rides all day long a mile long track with various stops including the period village scene, where you can step back in time and along the recreated street. 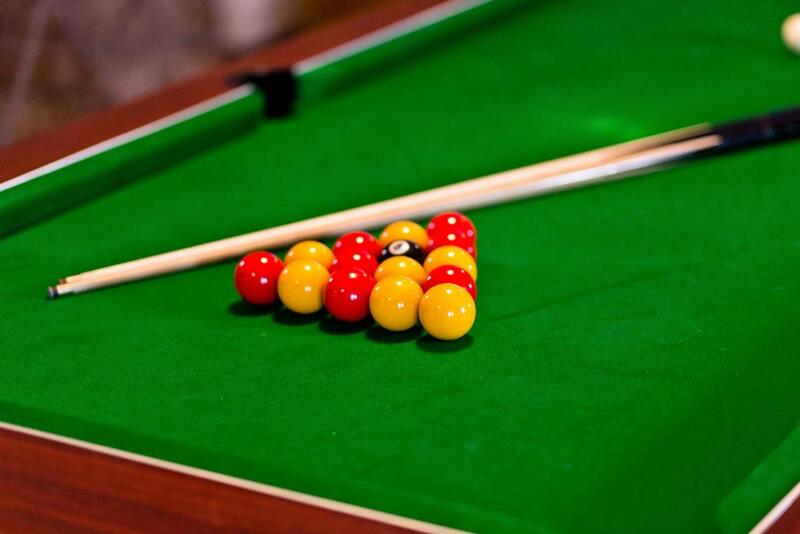 Enjoy a drink in the recreated 'Red Lion Pub' or explore one of the exhibitions in the recreated 'Derby Assembly Rooms'. 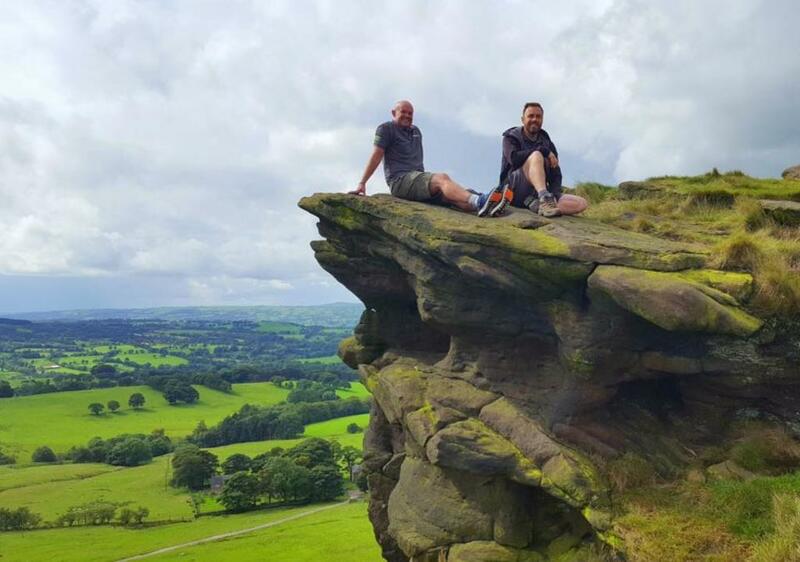 The woodland walk and sculpture trail is great for stretching the legs and to take in some amazing views over the Amber Valley. 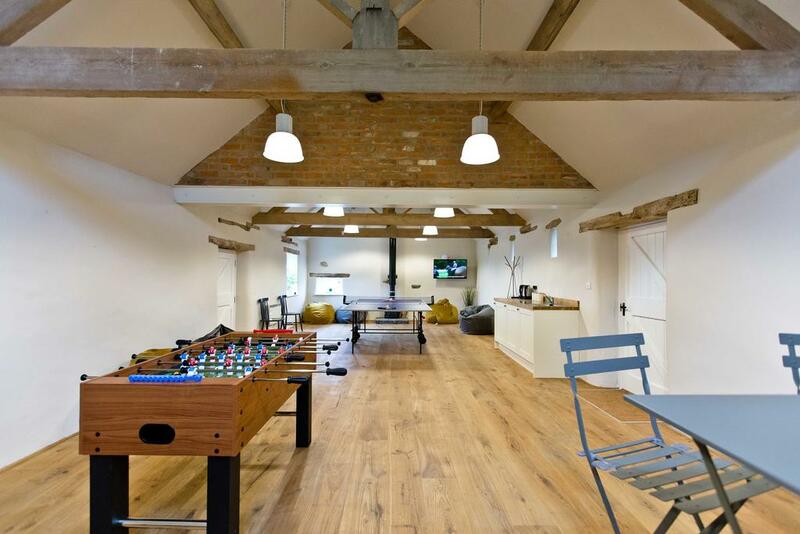 Children will also enjoy the indoor and outdoor play areas. 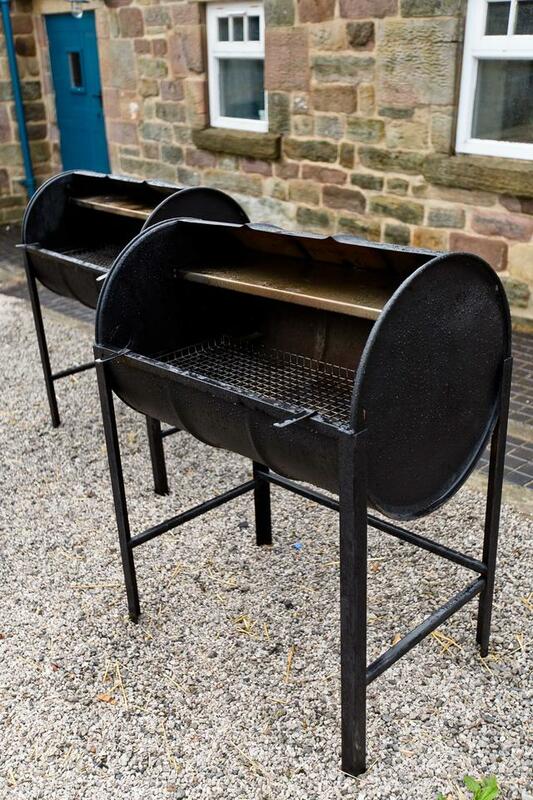 ​2 x Large oil drum BBQ – available for use from 01st April through to 31st October, please supply your own charcoal and lighting equipment. 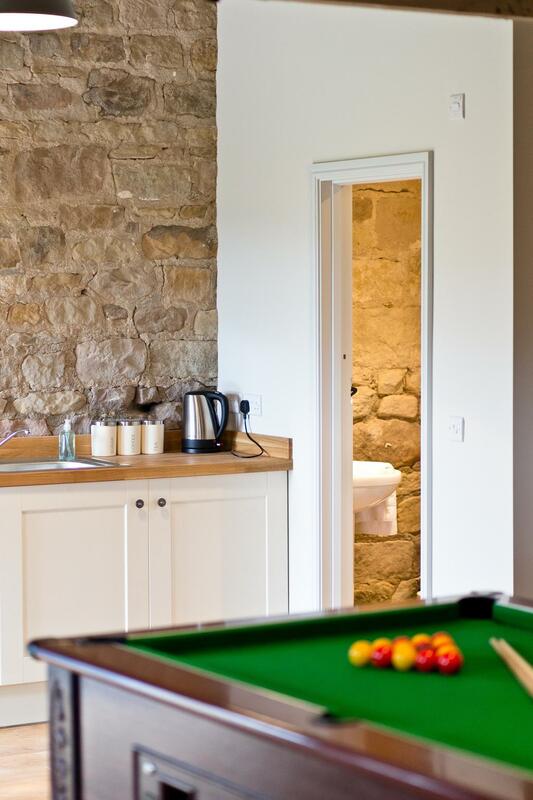 Washing Machine and Tumble dryer located in the laundry store across the courtyard. 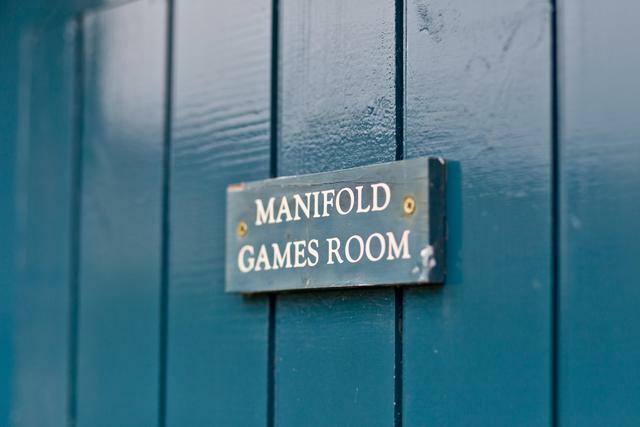 ​Please note that we are dog friendly at this property however there are livestock in the surrounding fields so dogs must be kept under control at all times. 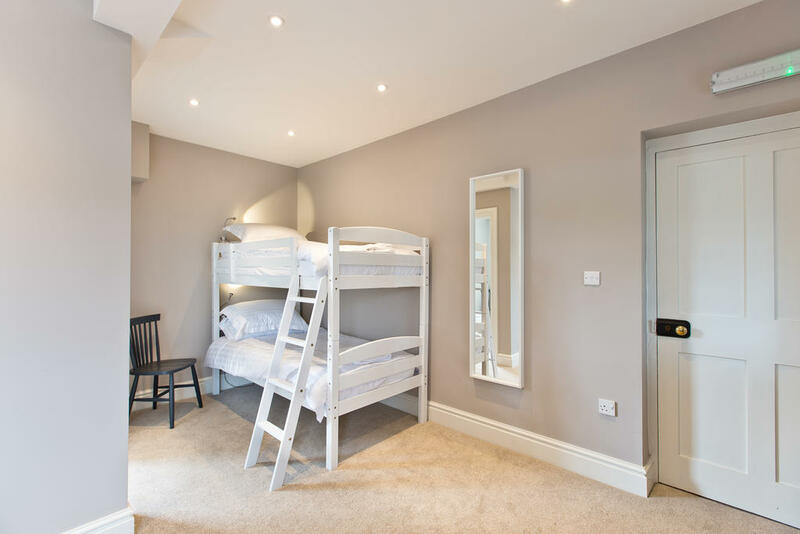 You will be expected to keep them out of the bedrooms and off the soft furnishings. 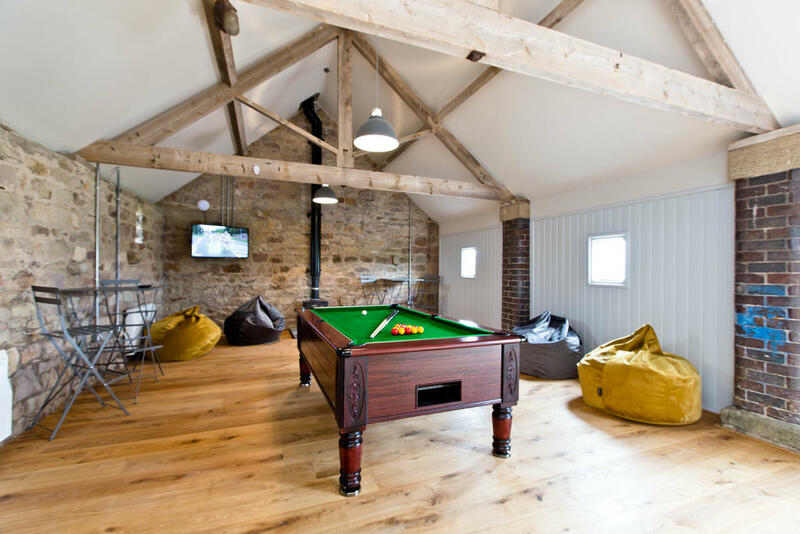 We are happy to accept up to a maximum of 6 dogs at the venue, please note unfortunately dogs are not allowed in the Annexe. 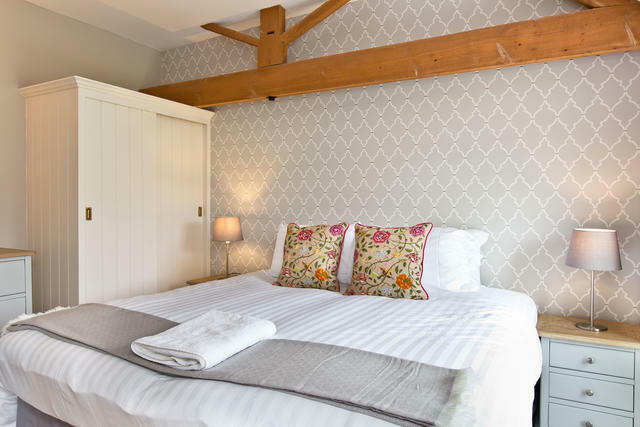 We do charge £20 per dog for the duration of your stay. Please see our dog policy for further details. 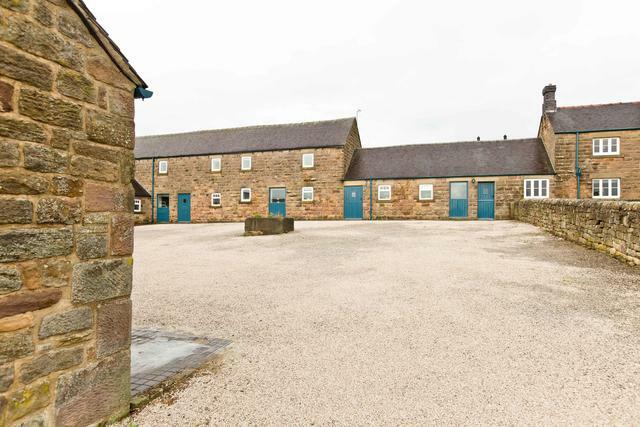 Ample parking – Parking area in the courtyard for Manifold Barns and parking area to the rear of the venue for Manifold Farmhouse. 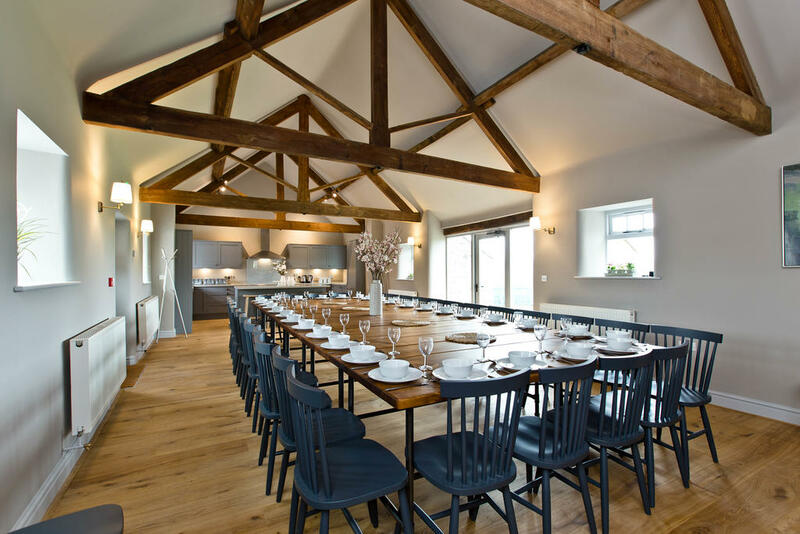 Our guests often ask for recommendations for local farm shops and butchers for the all-important celebration meals and this is a brilliant and very easy service. 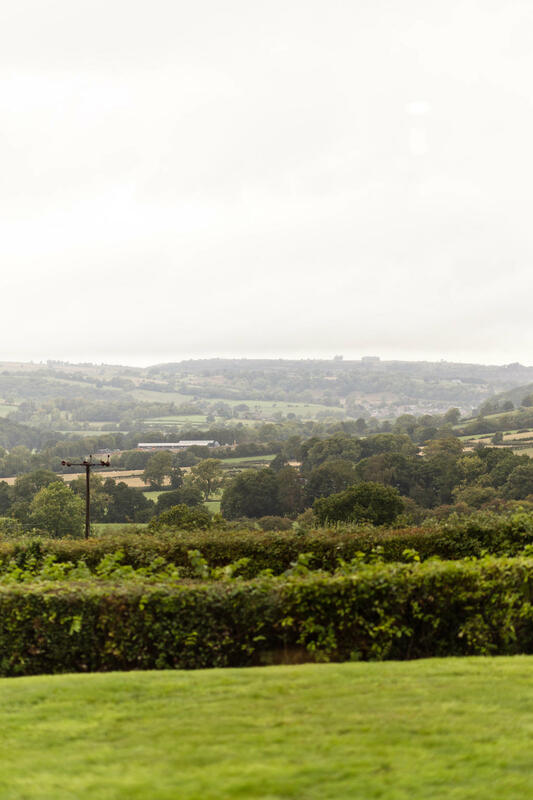 Sauced Here has similar functionality to an on line supermarket but is only stocked by local suppliers in the Peak District - order your wine, meat, vegetables, dairy and so much more with a choice of over a thousand products and at reasonable prices.